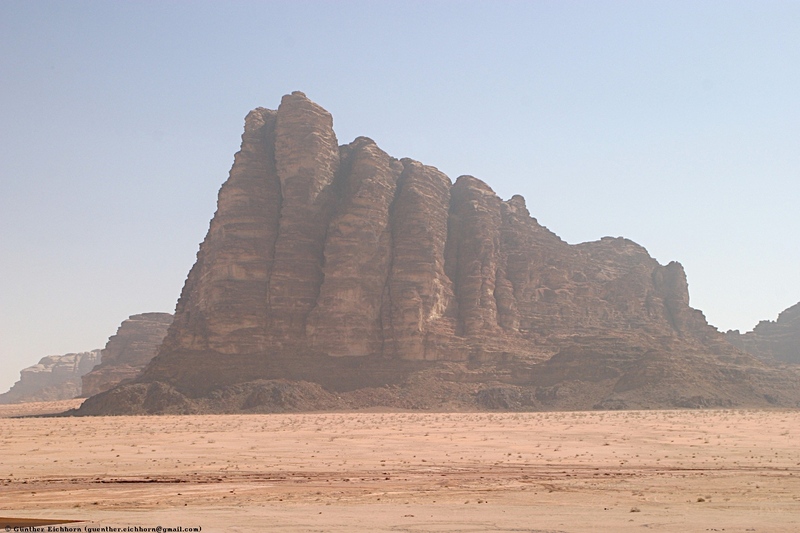 From 3 - 19 February 2006 I visited the Middle East on a combined Jordan/ Egypt tour, organized by Overseas Adventure Travel. I was supposed to arrive on 1 February, but my flight from Boston to New York JFK was canceled. The next flight was delayed, so I missed my flight from JFK to Cairo. I ended up staying in New York City for two days, since Egypt Air flies only every other day. 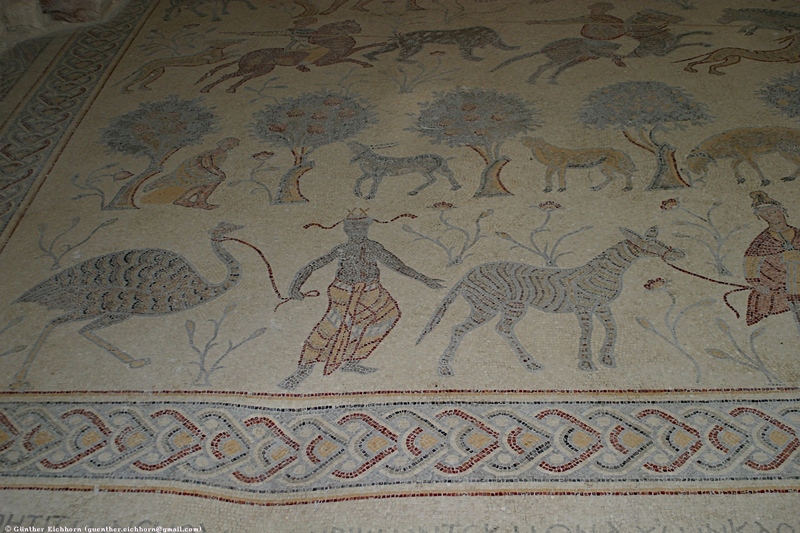 I missed part of the Jordan trip, visits to the Dead Sea and Greek and Roman settlements in Jordan. 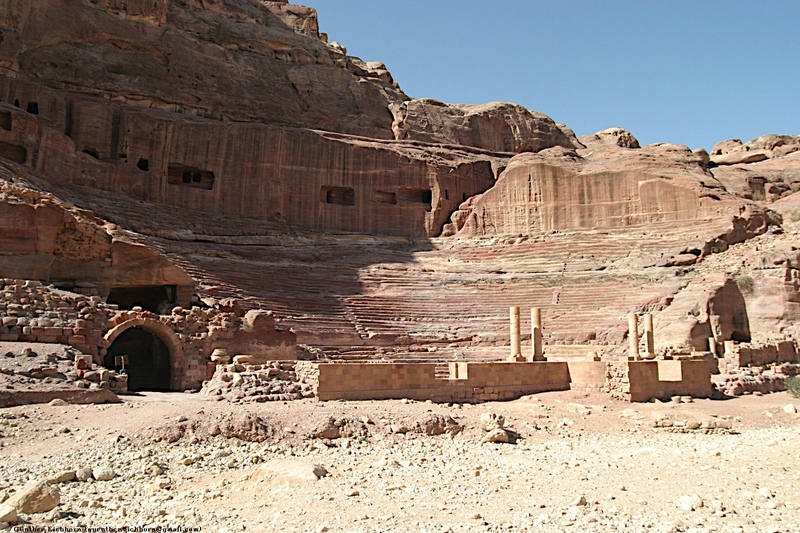 Fortunately the visit to Petra started the morning after I arrived, so I didn't miss the visit to the most important site in Jordan. 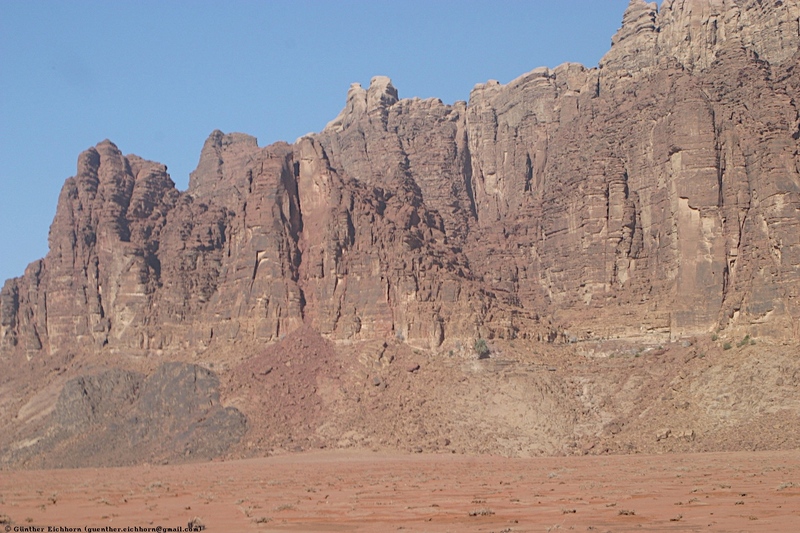 After Petra we visited Wadi Ram (often spelled Wadi Rum for English speakers, since Ram is pronounced like the English word Rum, just with a longer vowel) and then flew to Cairo for the Egypt part of the trip. Security was tight everywhere. Every hotel has a metal detector in the entrance, and bags are searched frequently. I didn't feel uncomfortable with all the security, it hopefully helps to deter terrorists. 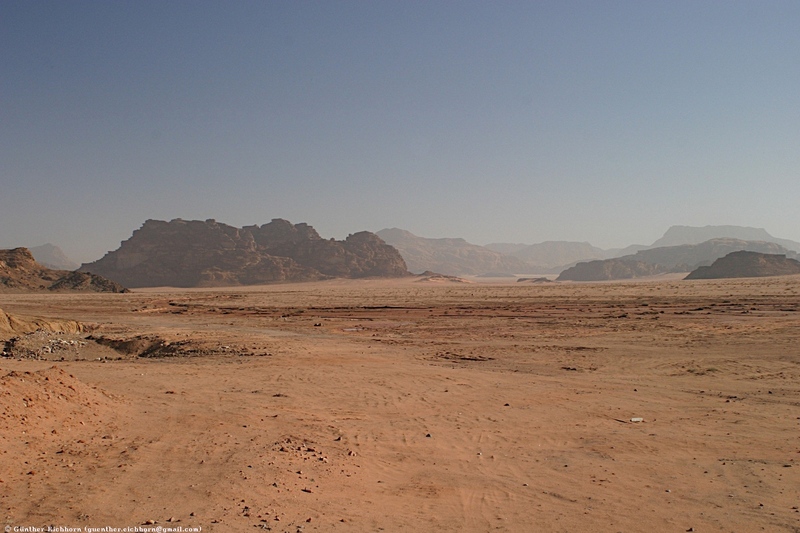 Much of Jordan is desert. 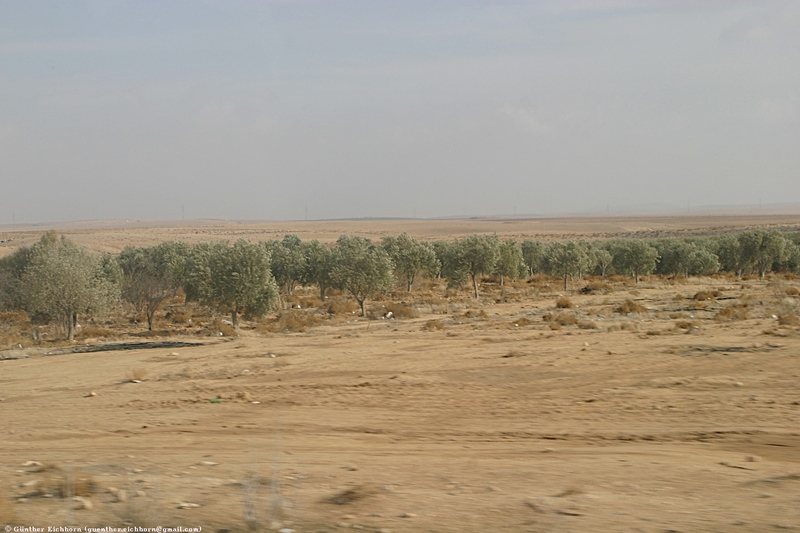 All farmland must be irrigated, at least in the parts of Jordan that I saw. 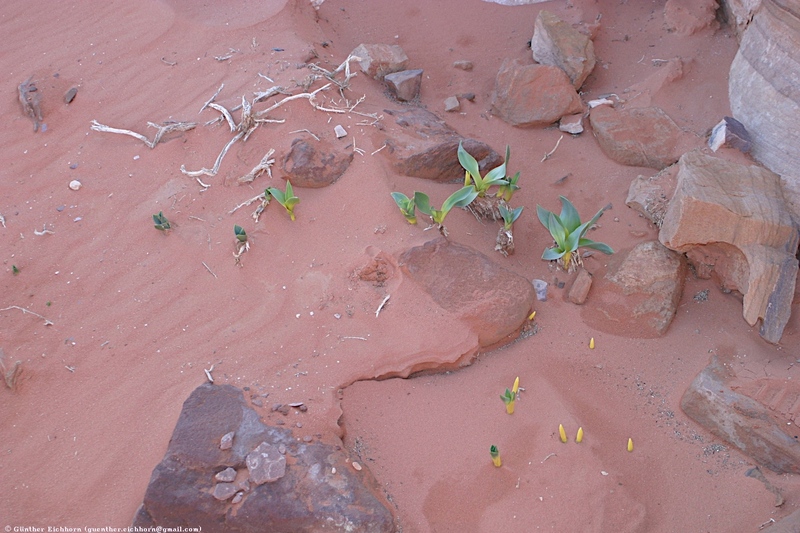 The weather was actually quite cold, the temperatures at night close to freezing, and during the day only around 5°C (41°F). Only rarely did they reach 10°C (50°F). The food was very good. You usually get an assortment of salad-style dishes first, then an assortment of main dishes with chicken, beef, and fish. 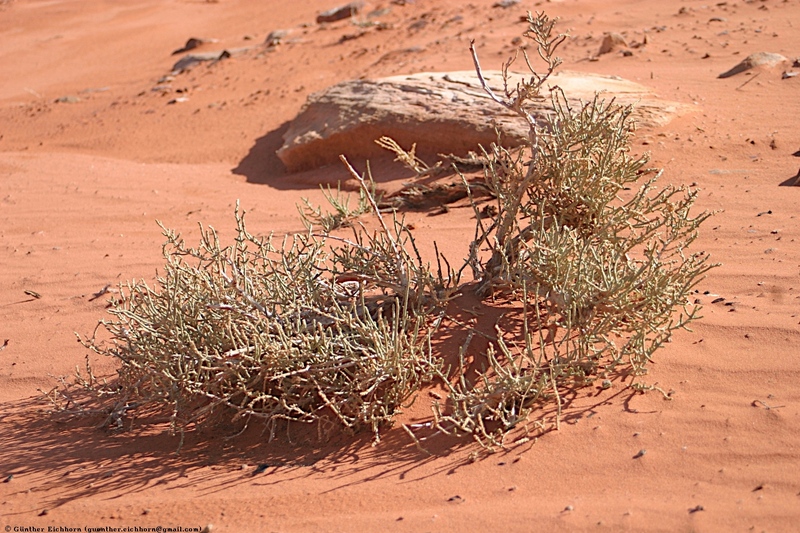 Deserts are usually very sweet. Hotel bars serve alcohol. 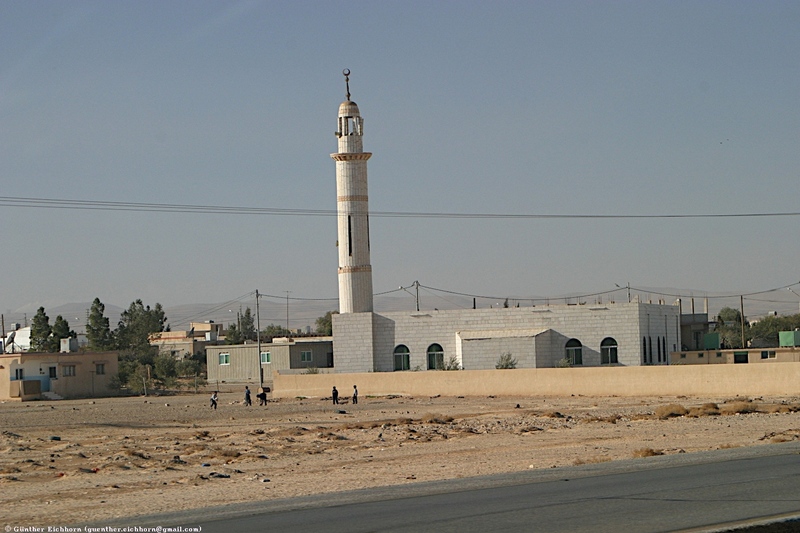 Because of my delay in getting to Jordan, I didn't have any time in Amman, so I don't know whether there are regular bars (other than hotel bars) in Amman. For the same reason I don't know what the traffic situation is in Amman (I arrived late at night, and left Amman early next morning). 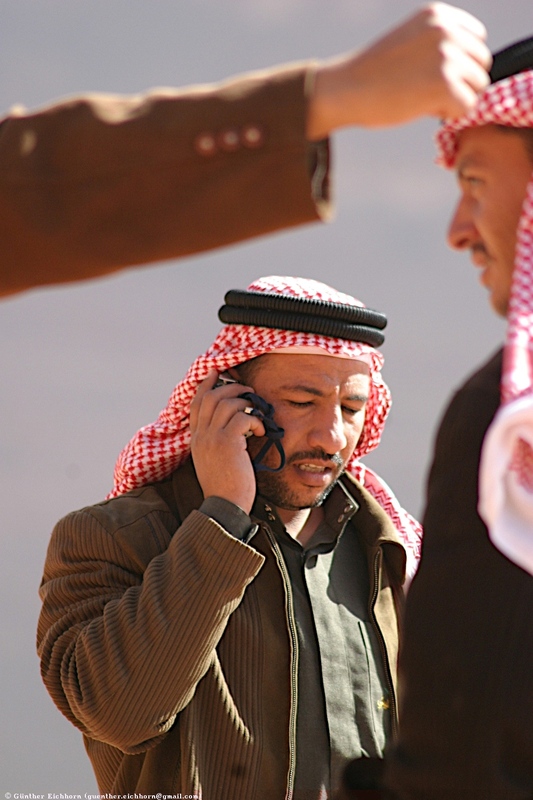 People seemed friendly, but because of my lack of free time in Amman, I can't say much more than that. 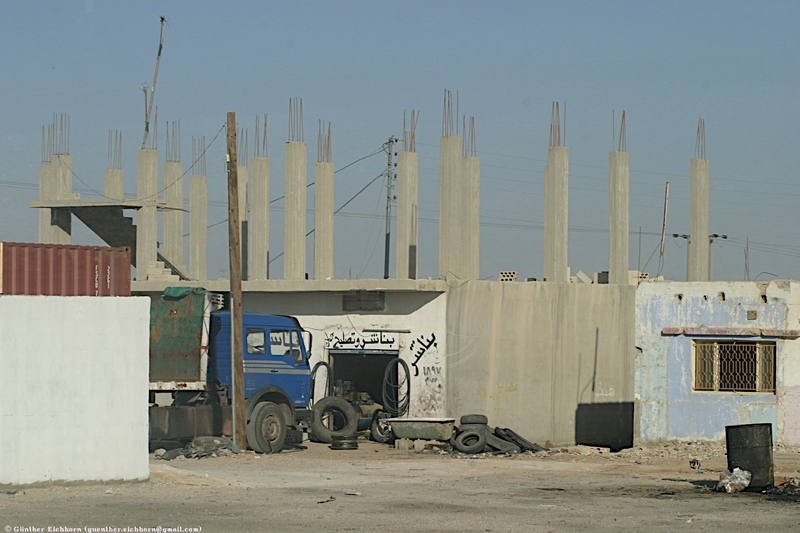 According to our guide, the education system in Jordan is very good. Education is free and according to our guide, more than 50% of the people go on to the university. 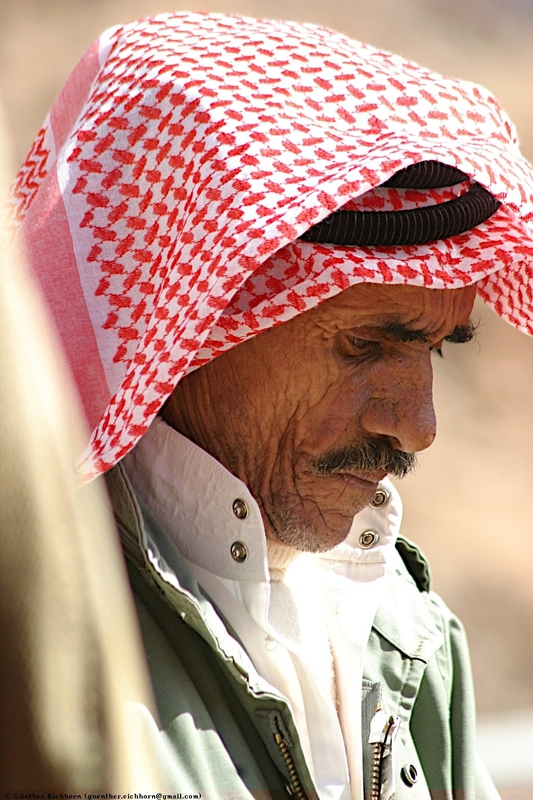 The health care system is also very good, with basic health care free for all Jordanians. I joined the tour on the morning of the third day. 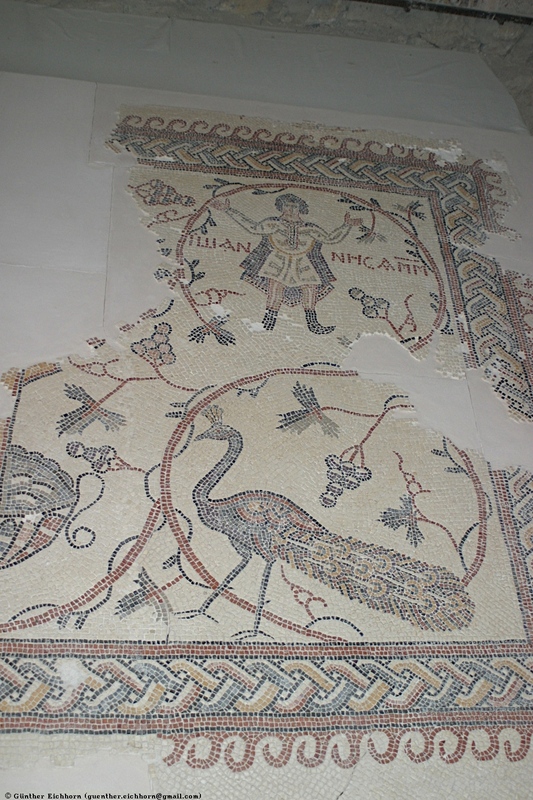 We left Amman and drove south on the King's Highway. 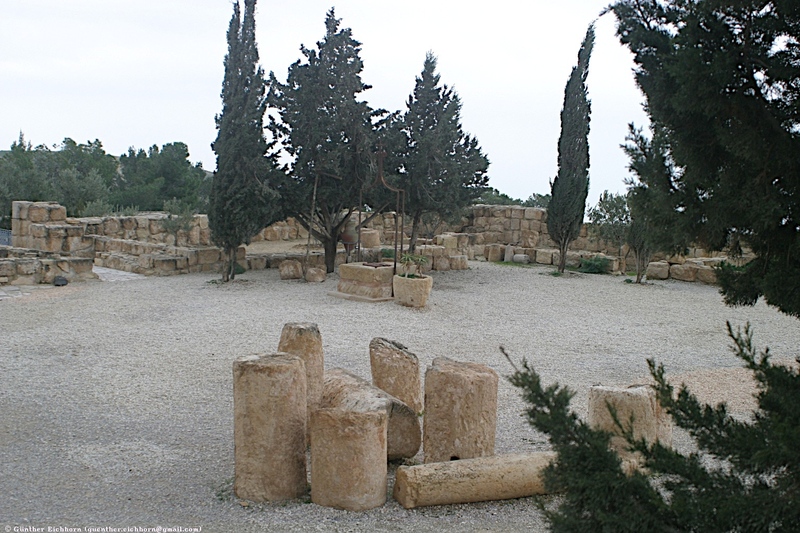 Our first stop was Mount Nebo. 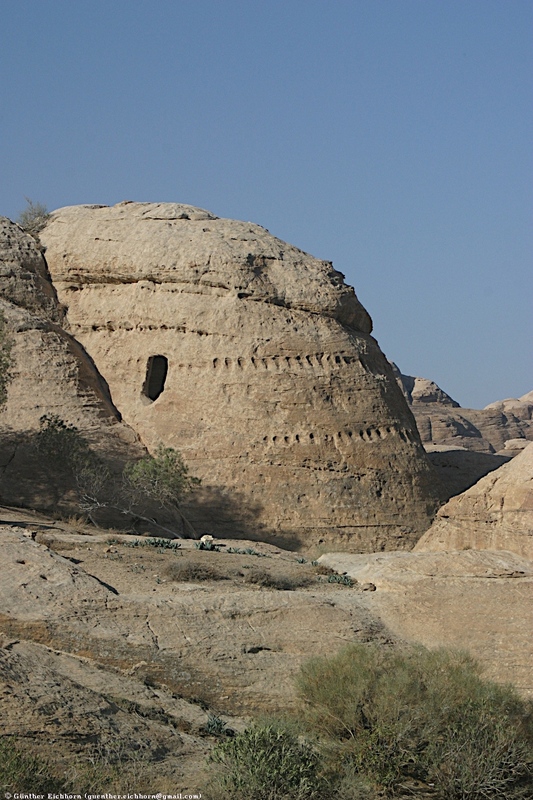 It is known as the burial place of Moses. 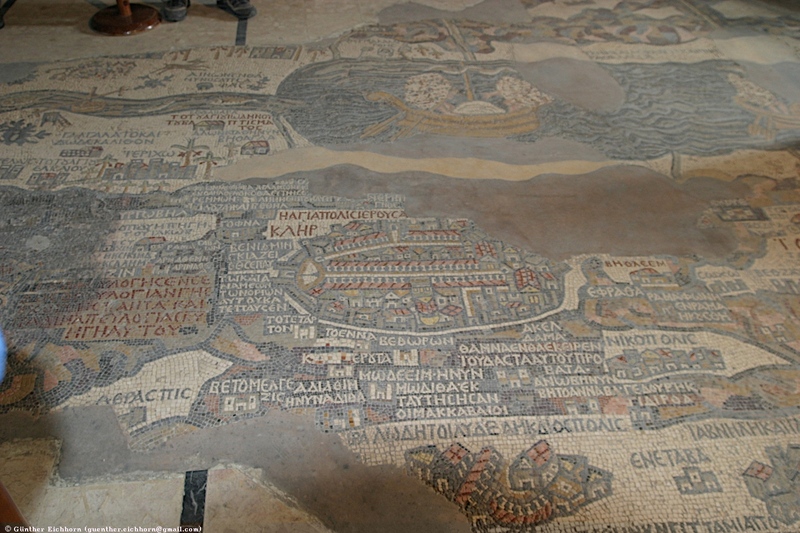 Early Christians had built the Church of Moses here. 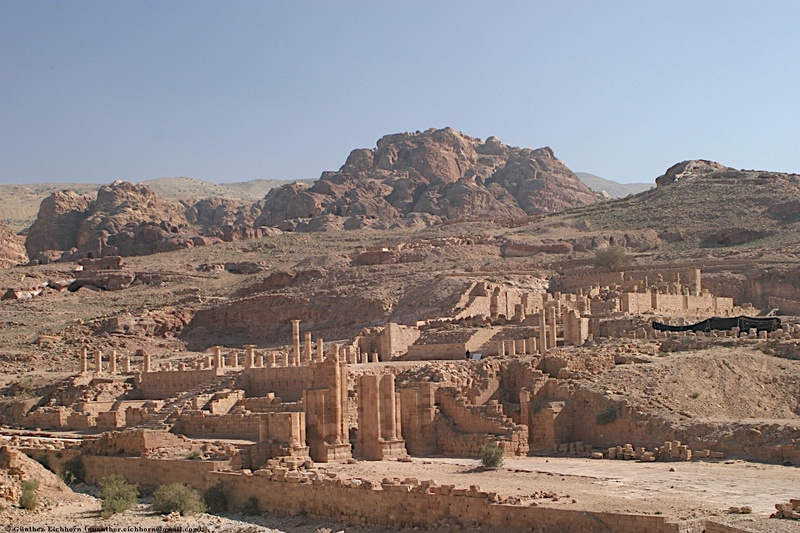 In the 6th century CE it was expanded into the largest monastery complex in the Middle East. 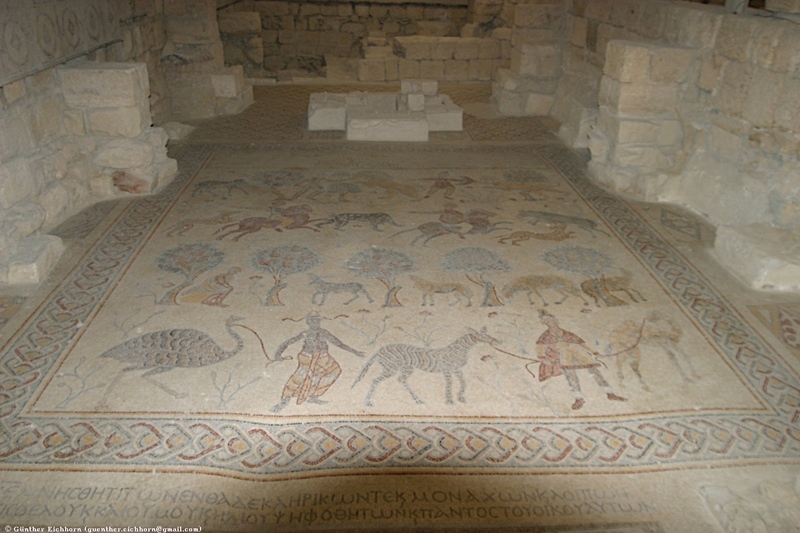 There are exceptional floor mosaic in the church at Mt. Nebo. 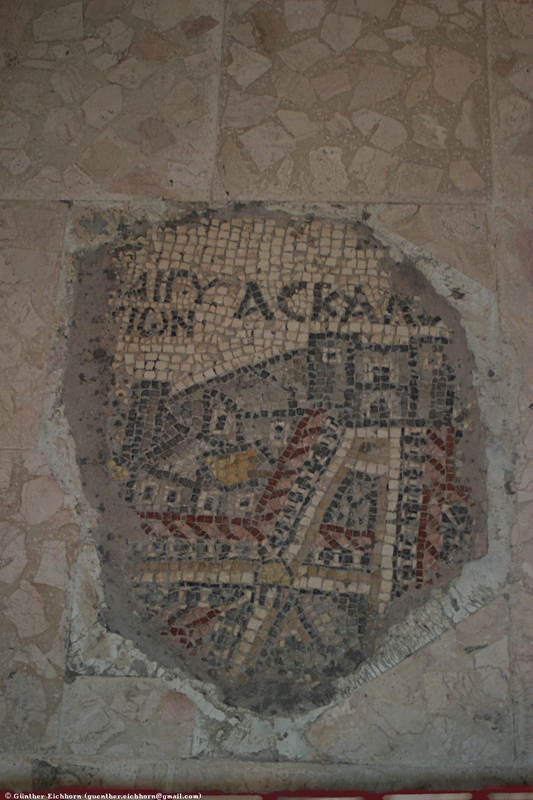 From there we went to Madaba to visit St. George's Church. 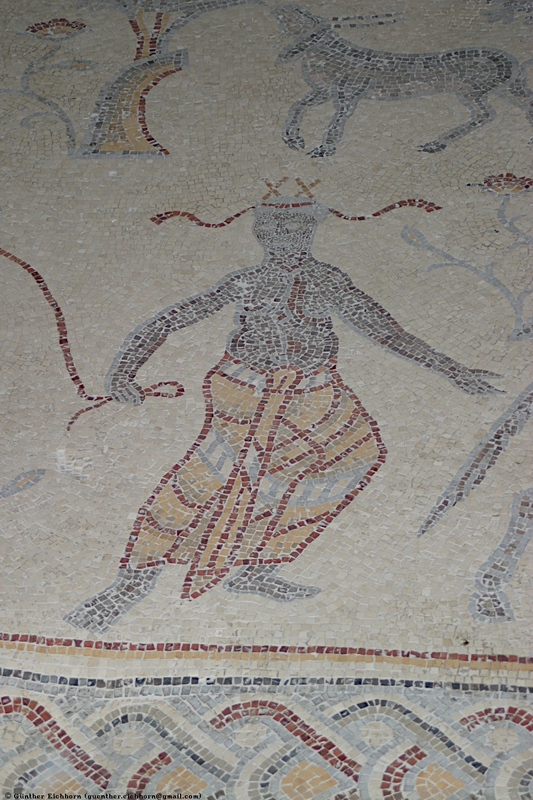 It too has an exceptional floor mosaic. 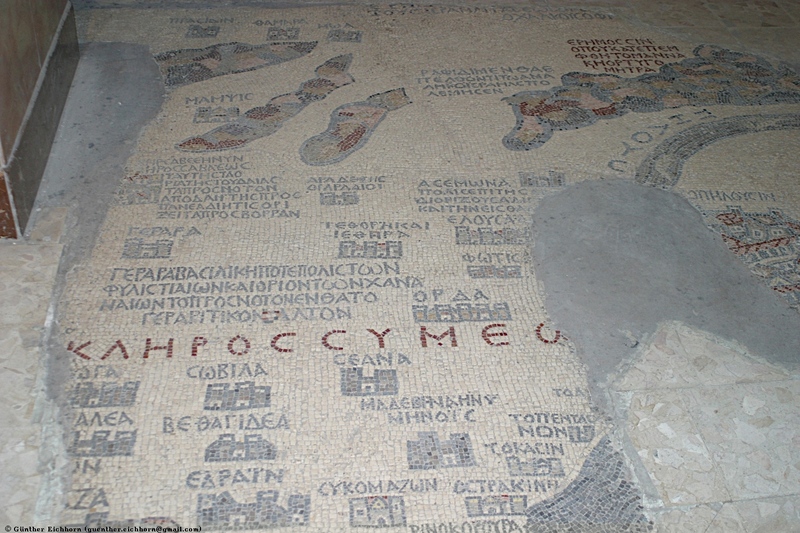 This mosaic is a map of the surrounding area with the Dead Sea and the Jordan River. 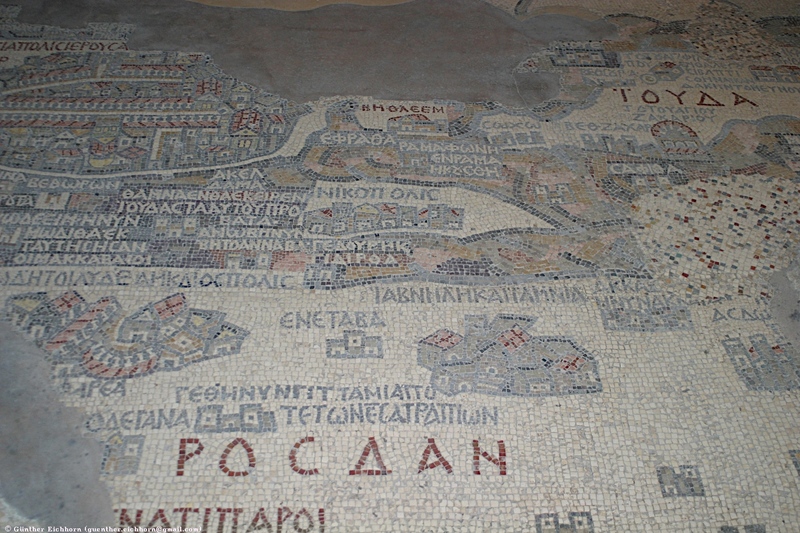 This is the oldest existing map of this area. 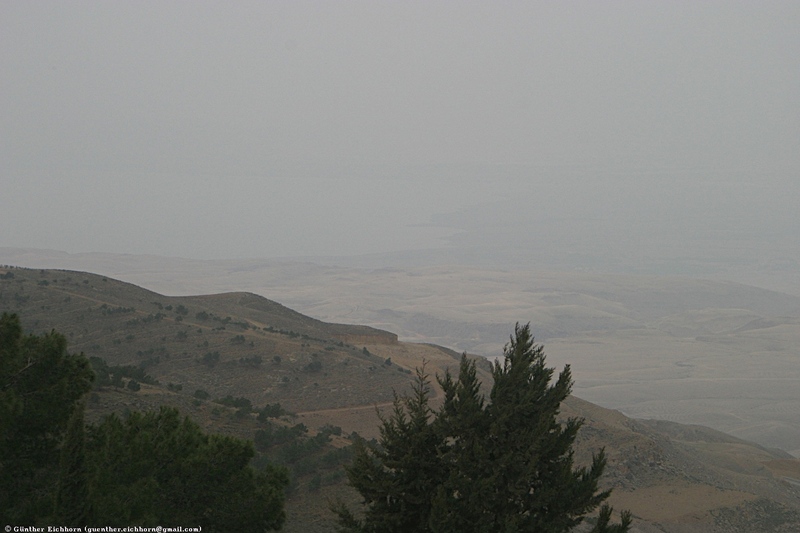 The next stop was at an overlook with a view of a reservoir in the Jordan River valley. 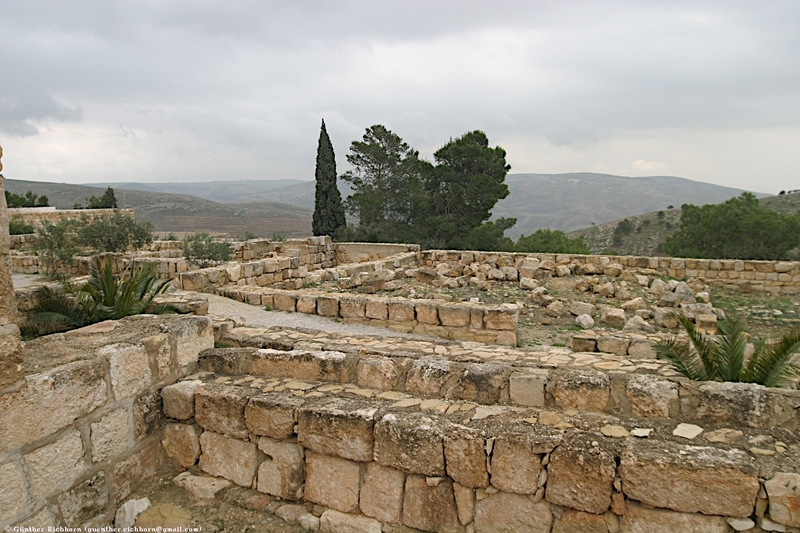 The valley there was called Arnon's Valley in the bible. It is a very scenic location. 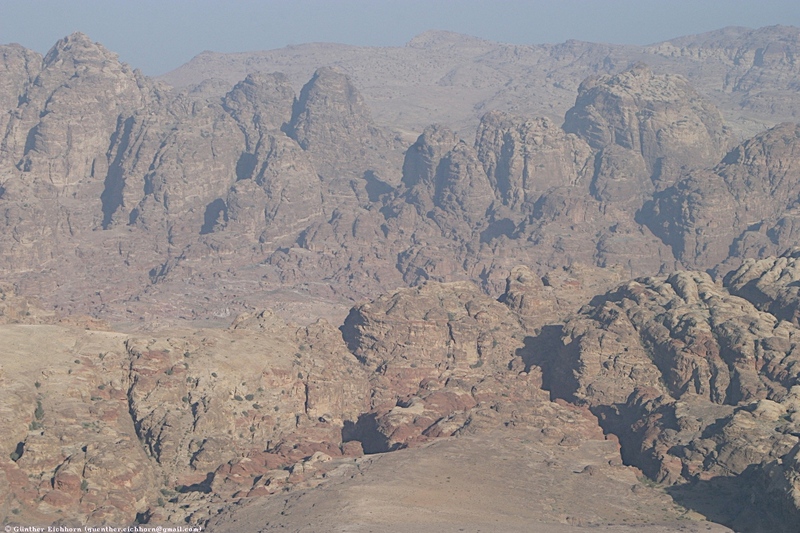 From there we drove to Petra. 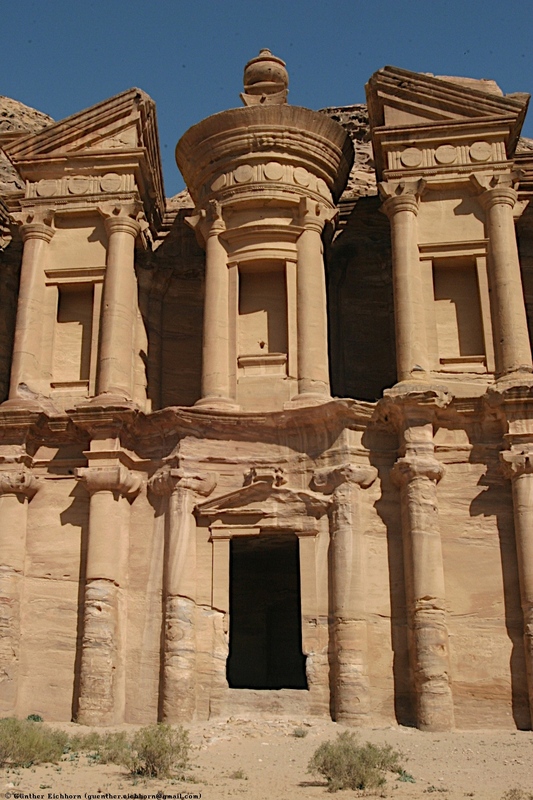 We stayed in a hotel in modern Petra for two nights. 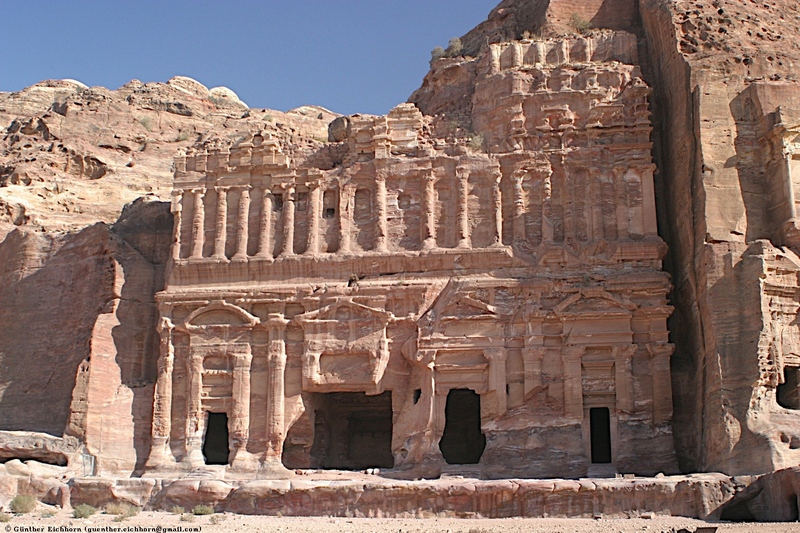 The ancient city of Petra was build by the Nabataeans. 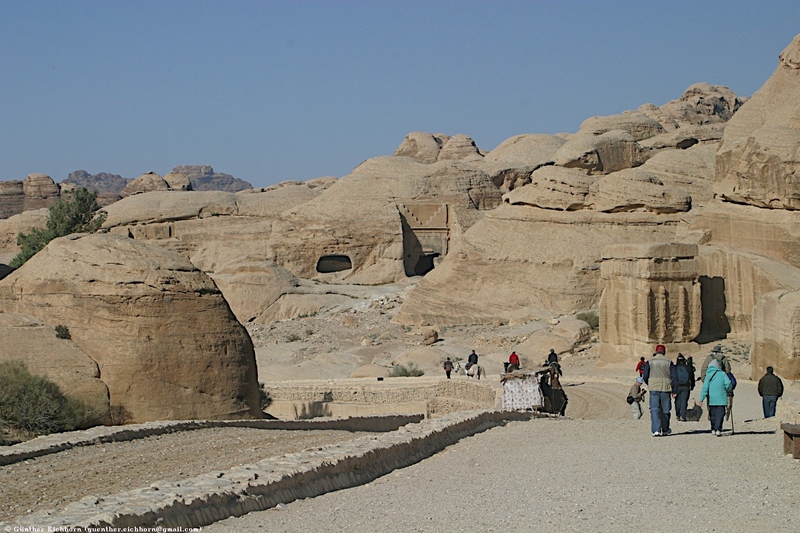 The Nabataeans were a nomadic tribe that settled in the area around the 6th century BCE. They were essentially highway robbers. 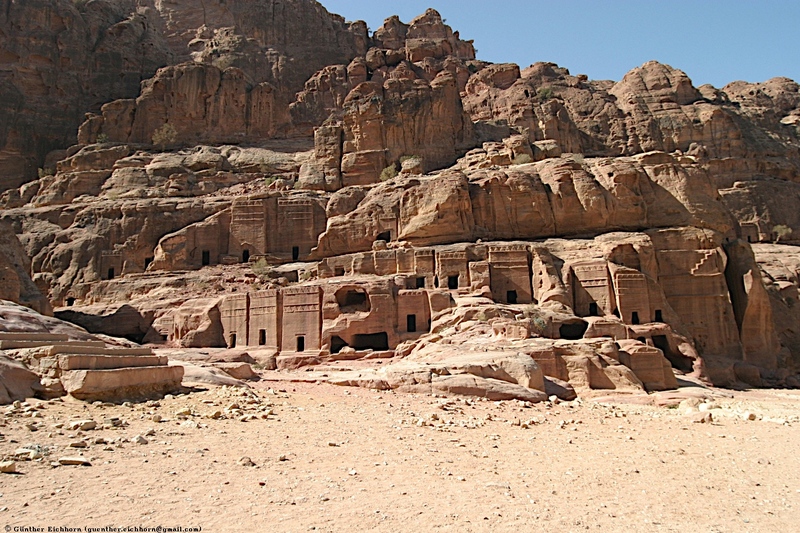 They became rich by first plundering and then taxing the important trade routes through the area, the most lucrative trade being in frankincense. They managed to exert massive influence on the Middle East, not through conquests but through commercial power. 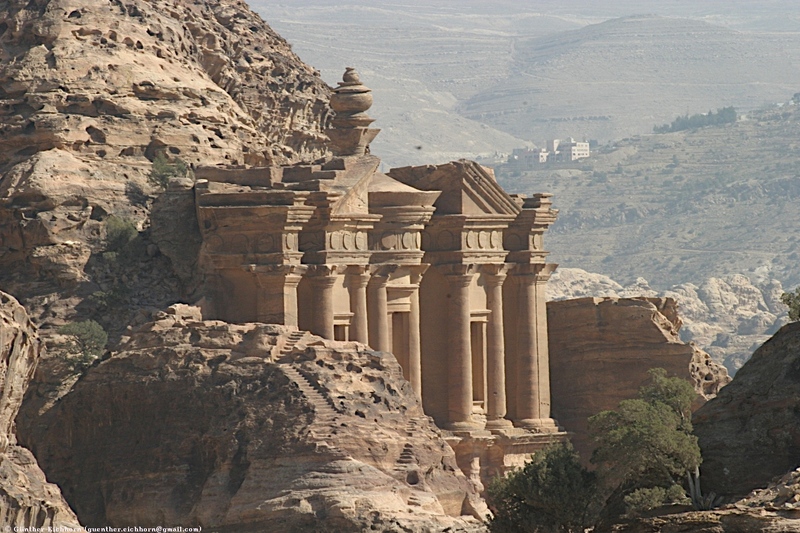 Petra is a UNESCO World Heritage Site. 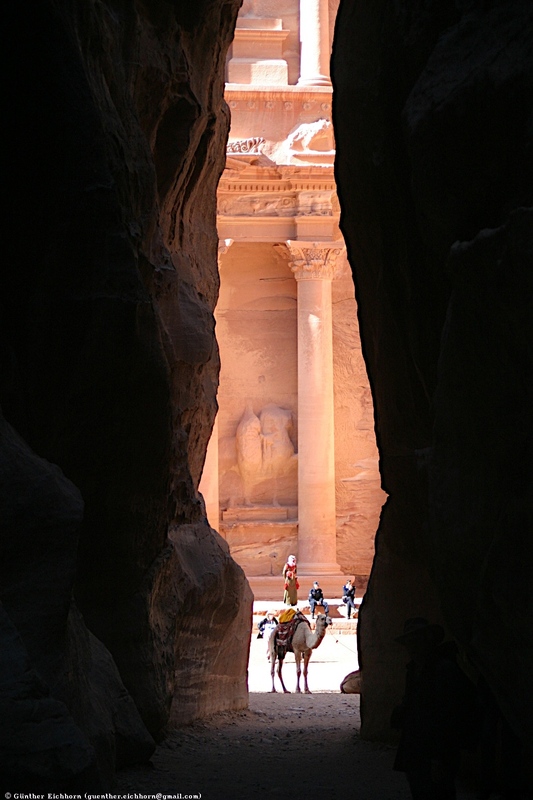 The construction of the Nabataean part of Petra is majestic. 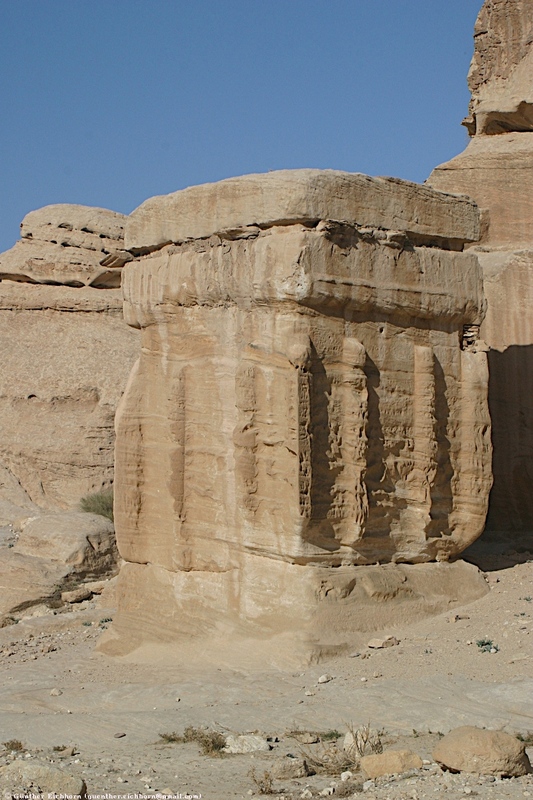 The huge temples and tombs are carved directly out of solid rock, not constructed by piling stones on top of each other. It is fantastic to see these buildings. 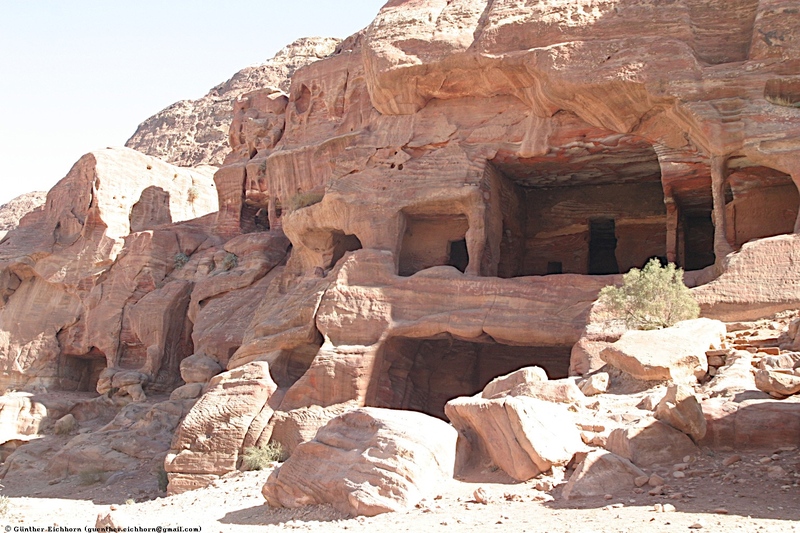 The Nabataeans were a thorn in the hide of the Romans. 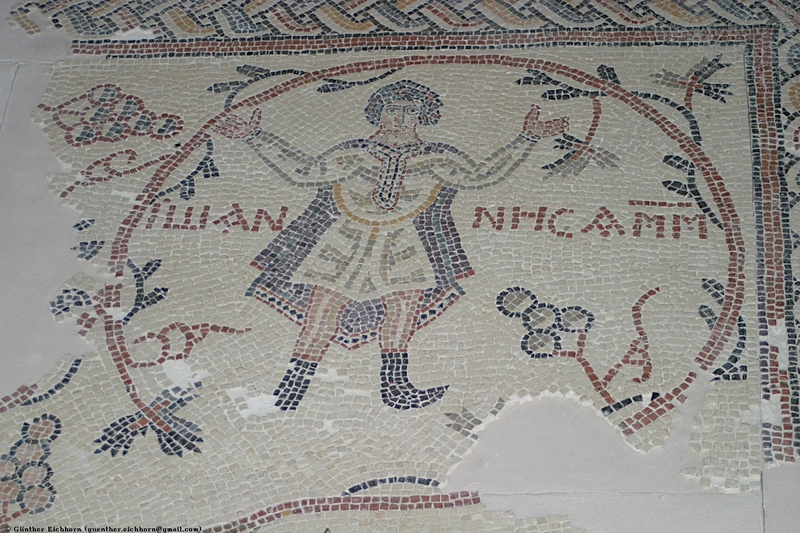 Eventually the Romans got fed up with the Nabataeans. 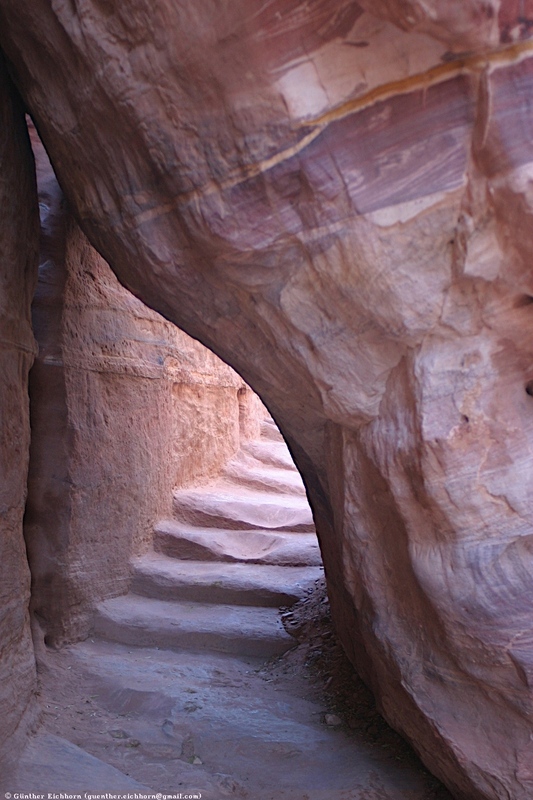 Since Petra is in an enclosed valley, access is only possible through a very narrow gorge, As-Siq. 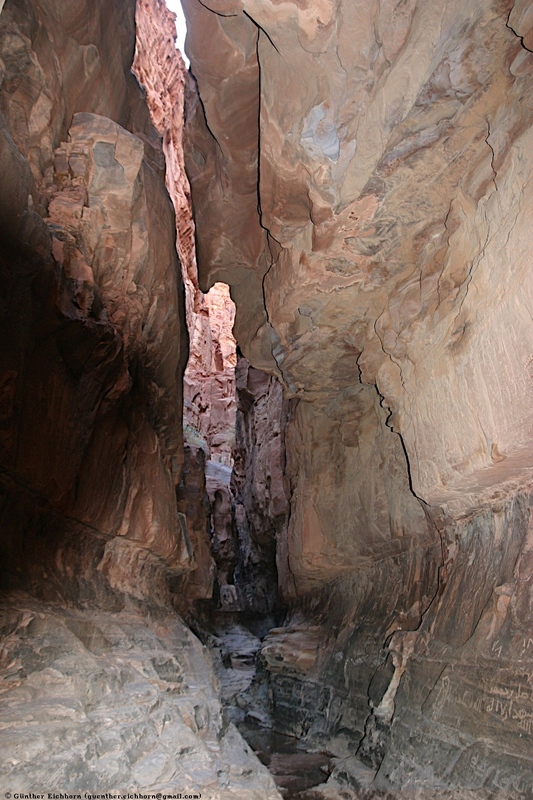 That gorge is up to 200 m (660 ft) deep and as narrow as 2 m (7 ft). 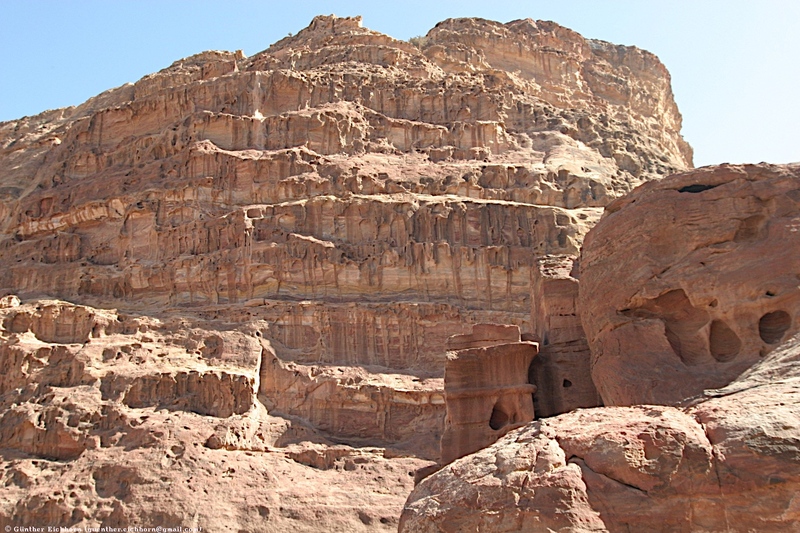 This gorge was easily defended, so conquest of Petra was not possible militarily. 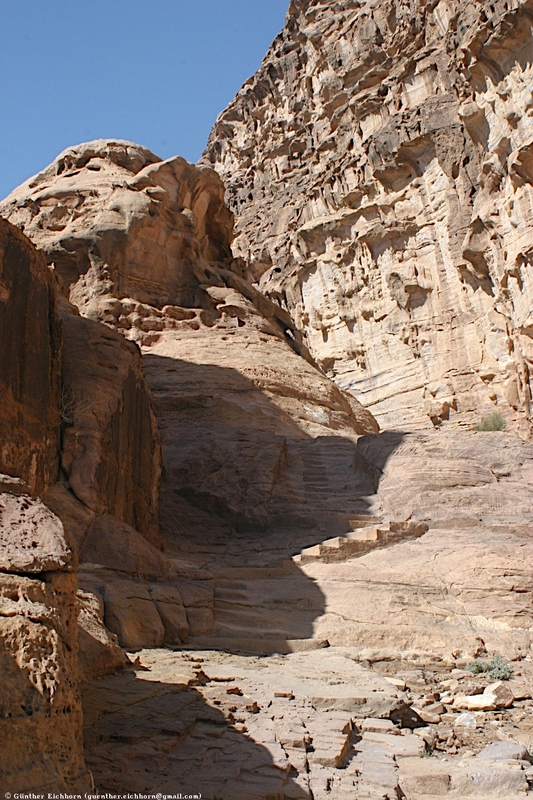 However, Petra had one weakness: All the water for Petra comes through that same gorge. 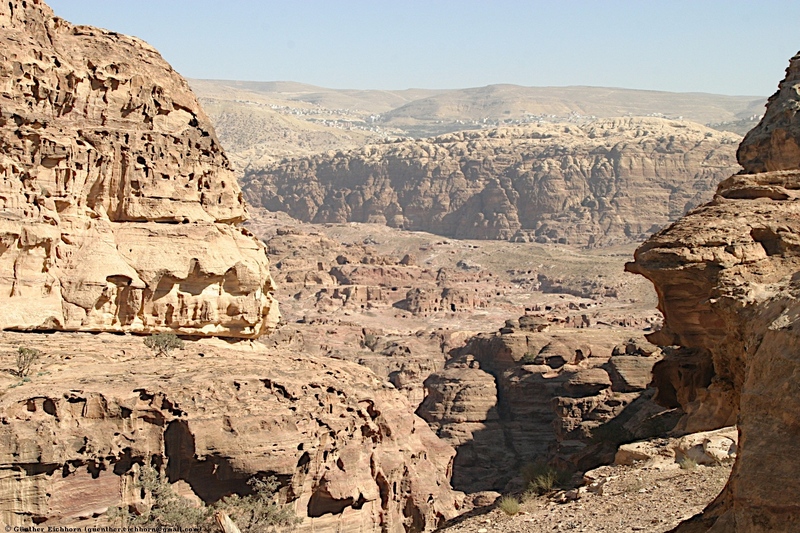 When the Romans were really fed up with the Nabataeans, they just turned off the tap. 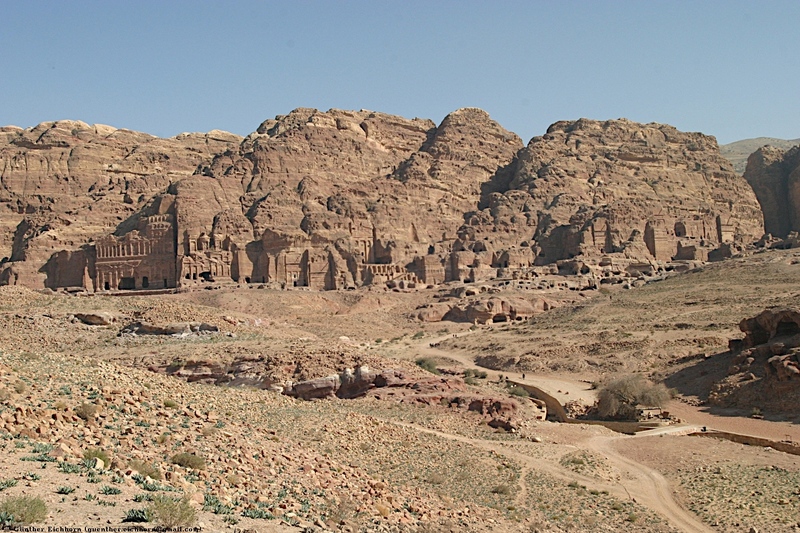 6 months later the Nabataeans surrendered, this was in 101 CE. 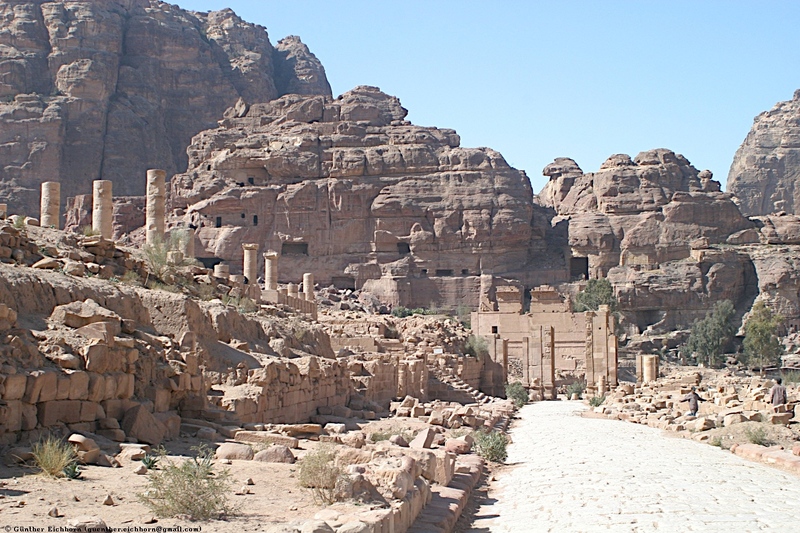 The Romans added their type of buildings to Petra: A colonnaded street, baths, and temples. 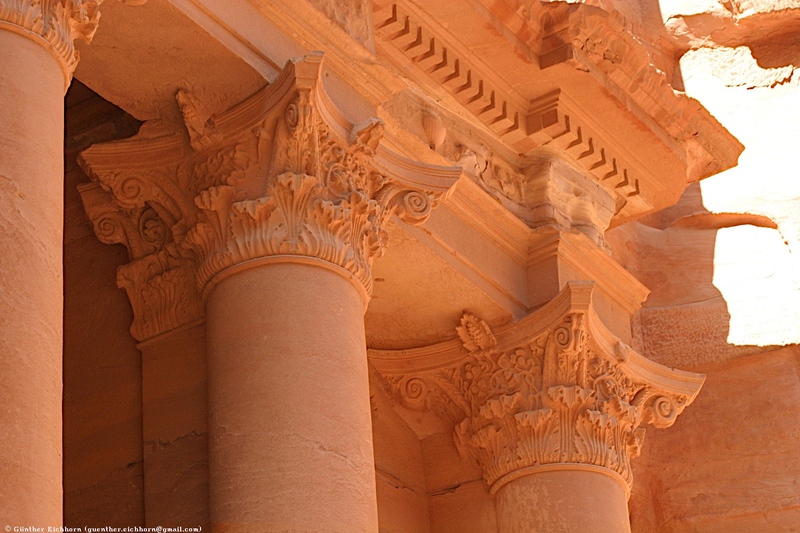 The Roman buildings were mostly built in the traditional way out of stones. 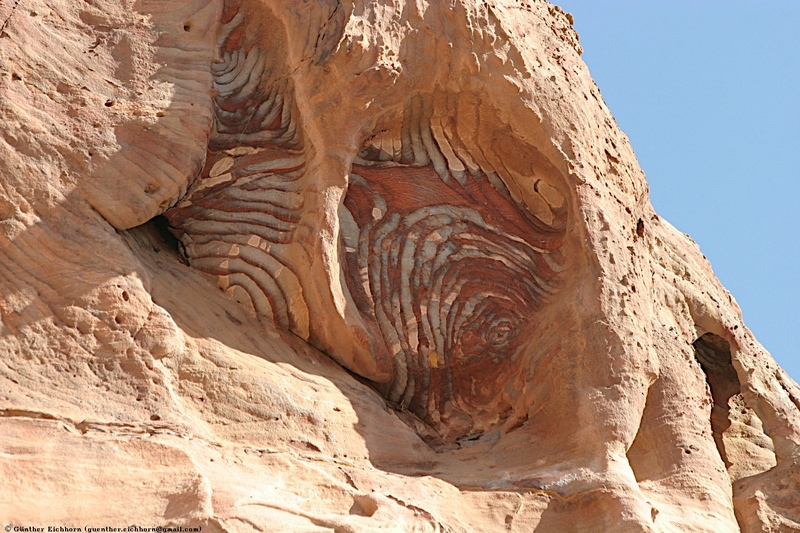 The exception is a very imposing amphitheater, carved out of the rock. 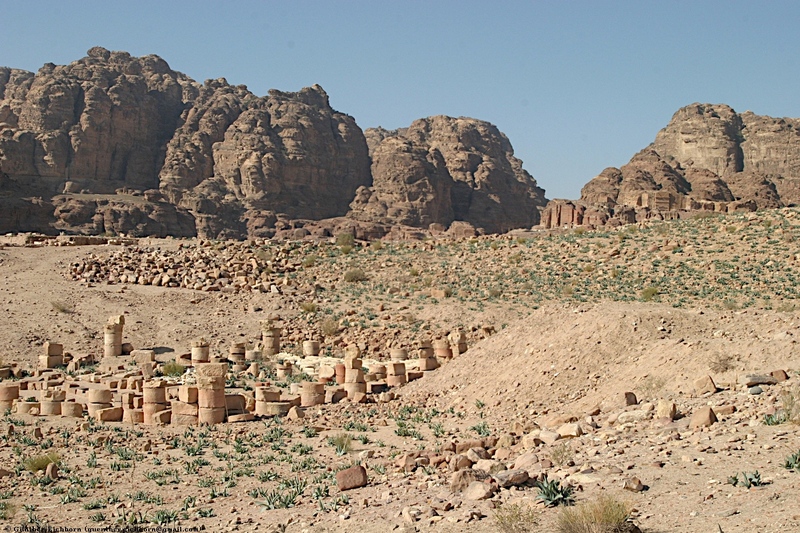 During the Byzantine period, a bishopric was created in Petra. 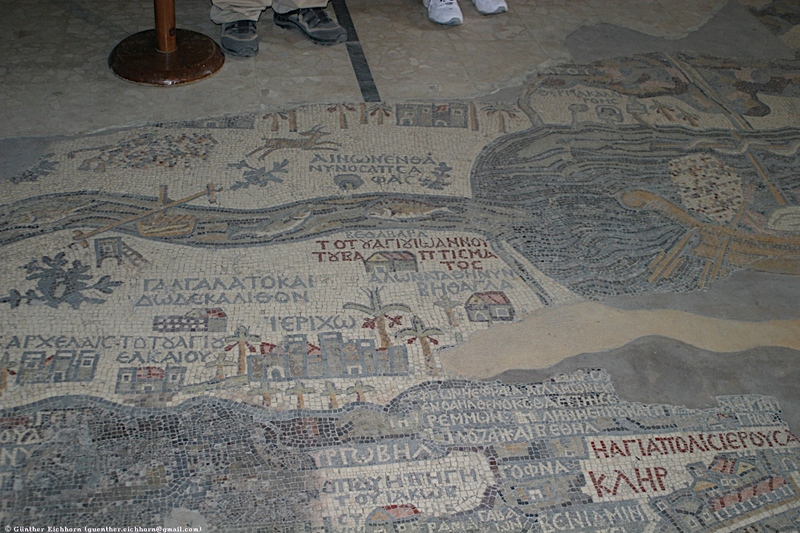 The byzantine church in Petra has some very nice floor mosaics. 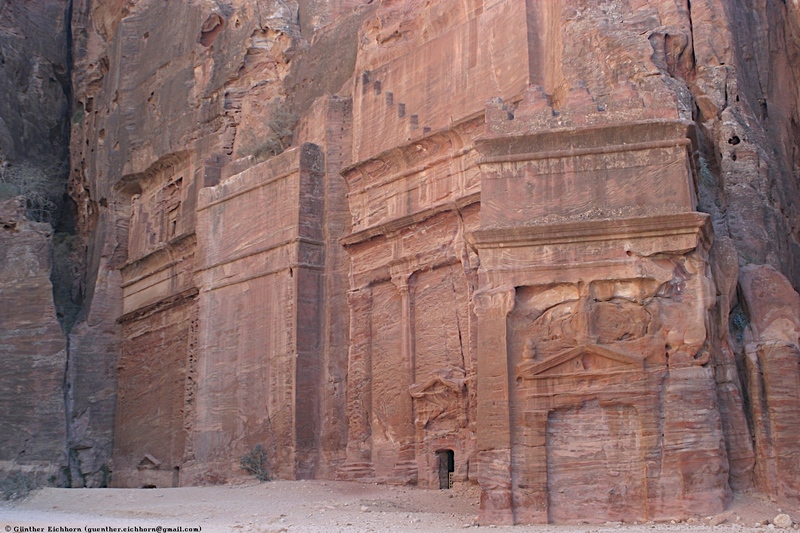 But after that Petra declined in importance. 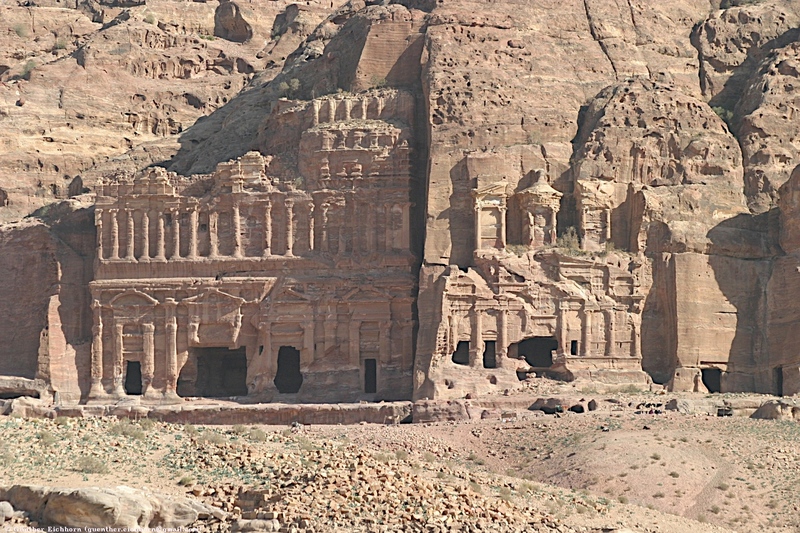 By the time of the Muslim invasion in the 7th century CE, Petra was mostly forgotten. 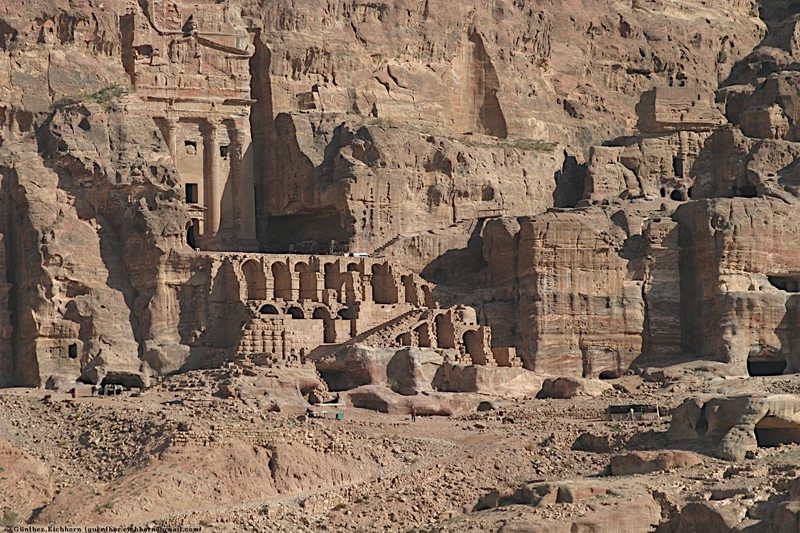 From then on there was not much activity in Petra. 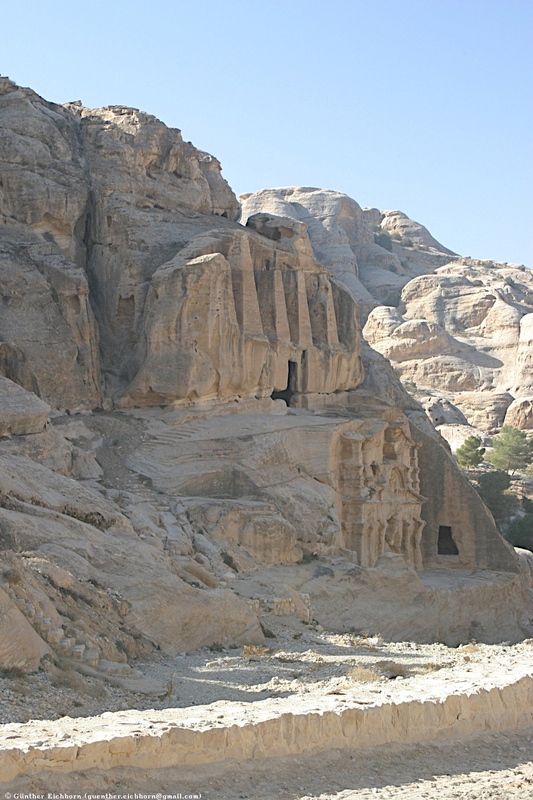 The local Bedouins lived in Petra, but were reluctant to tell outsiders about it. 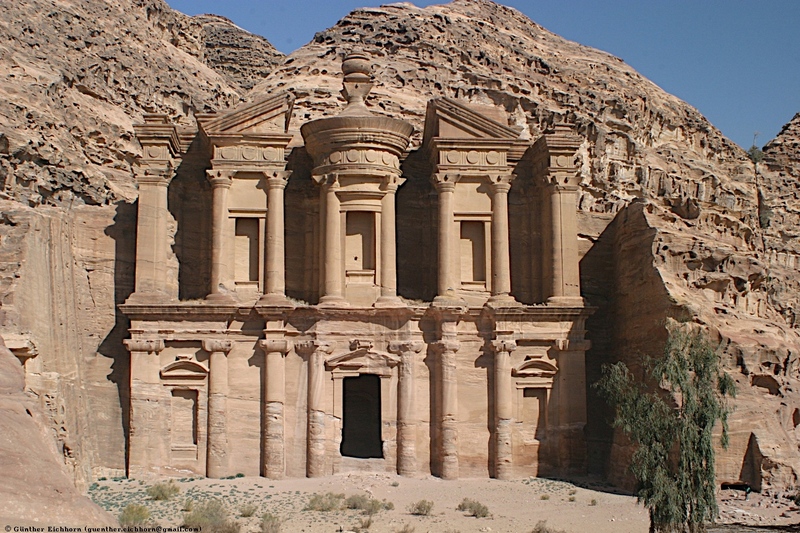 In 1812, Johann Ludwig Burckhardt, a young Swiss explorer re-discovered Petra, and the rest is, as they say, history. 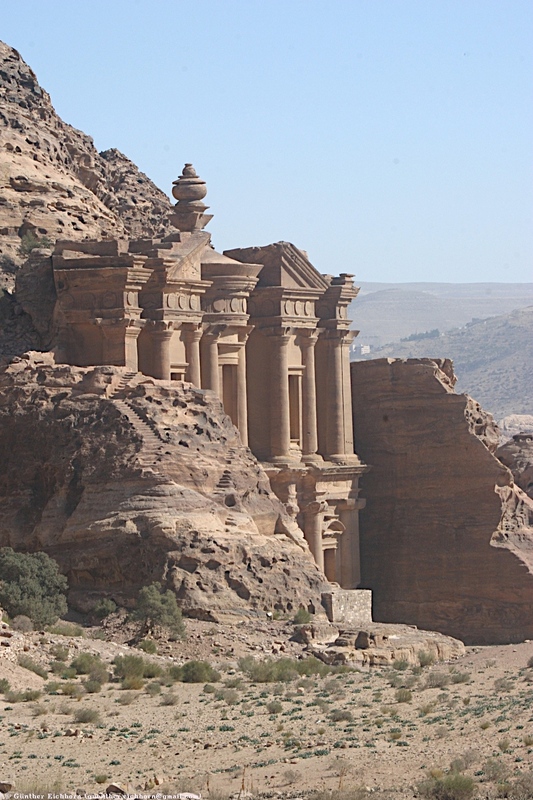 The excursion to Petra starts in modern Petra. A road leads down a valley towards the gorge. 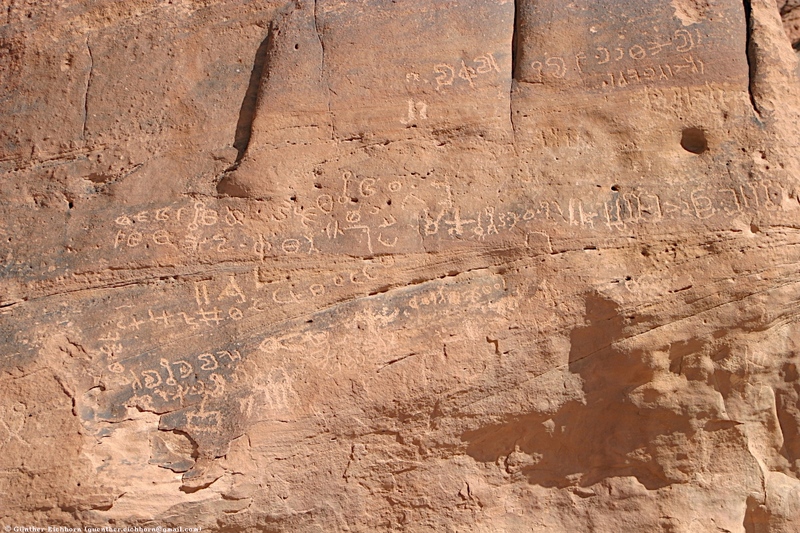 Along this road there are many buildings and monuments, and some ancient inscriptions on rock walls. 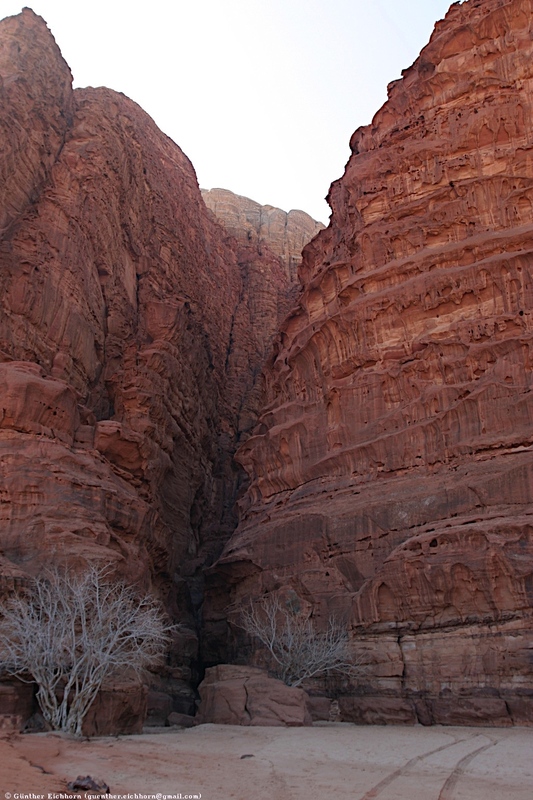 This part of the trip can be done on horseback. 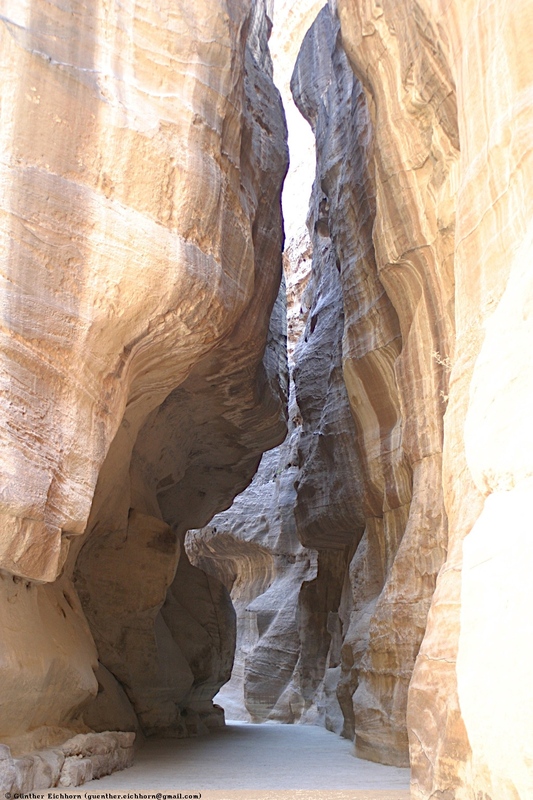 After about 1 km (0.6 miles) you get to the Siq, the gorge. 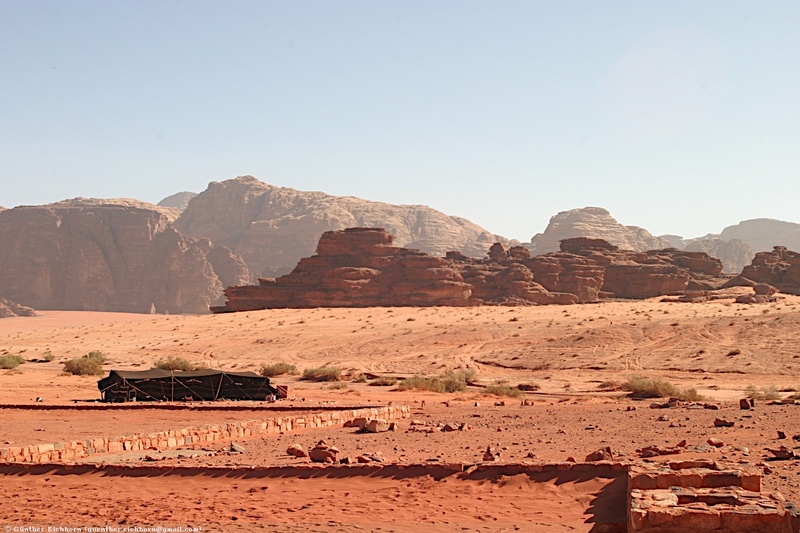 This part of the trip can be done either on foot or a horse-drawn cart. 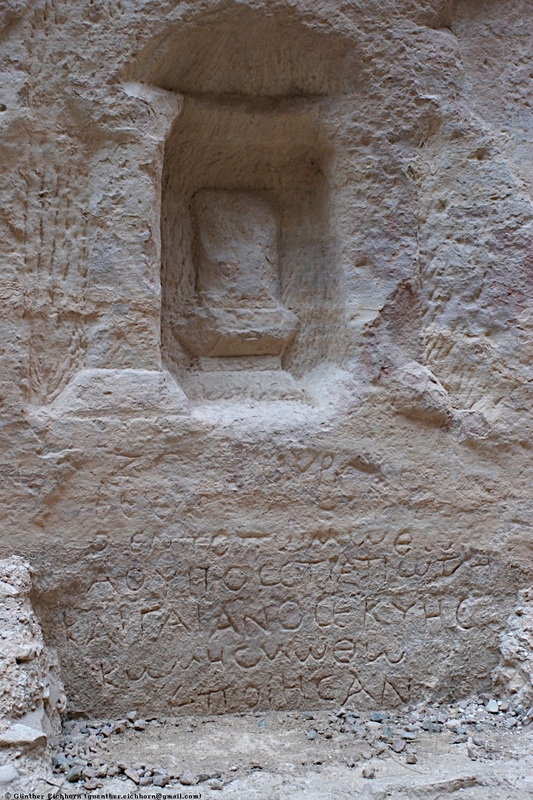 Some parts of the gorge still have the old Roman stone cover. These stones show deep ruts from the carts that the original inhabitants used. 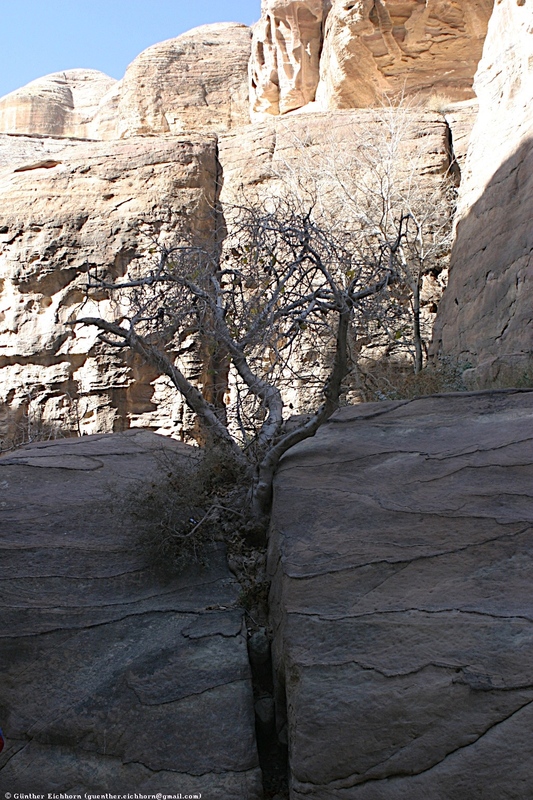 The water for Petra was brought in through the gorge. 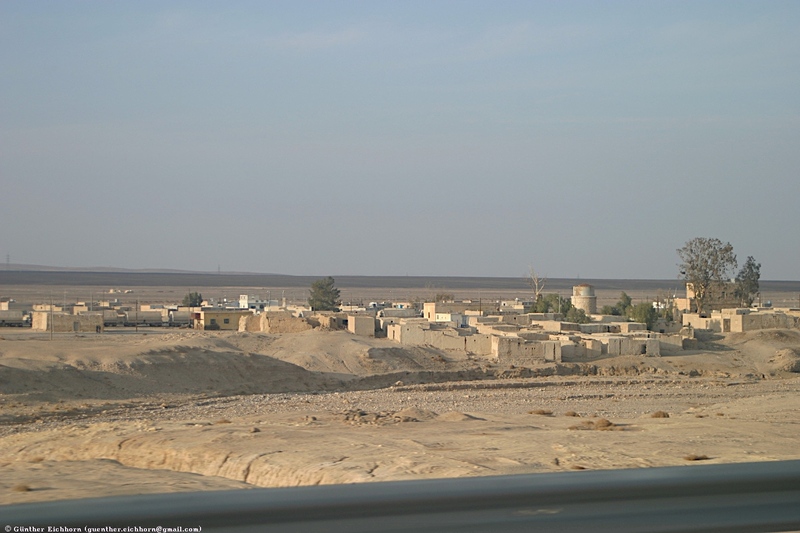 On the left side was an open channel for water for livestock and irrigation. 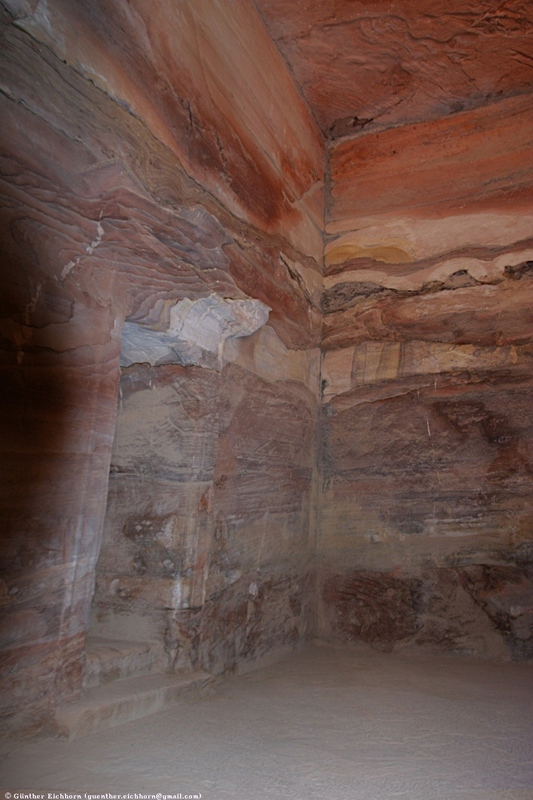 On the right side was a covered channel for drinking water. 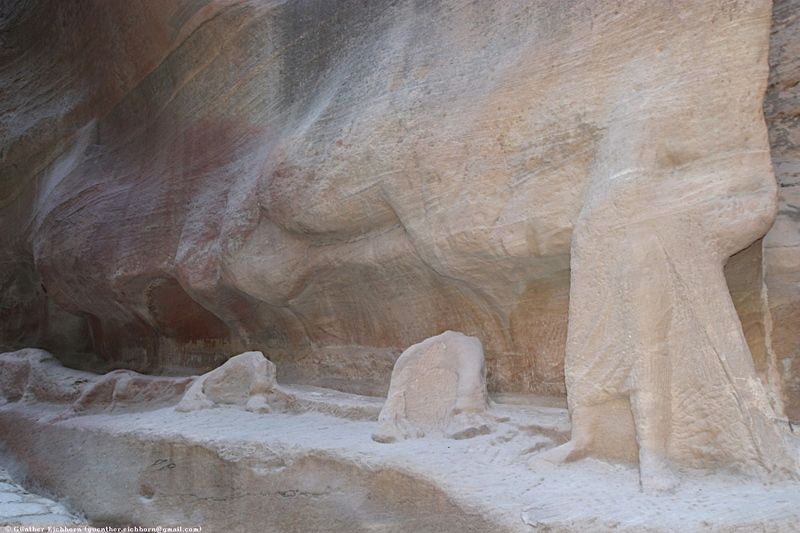 There were various prayer sites in the gorge, some buildings in the wider areas, and remains of stone-carved figures. 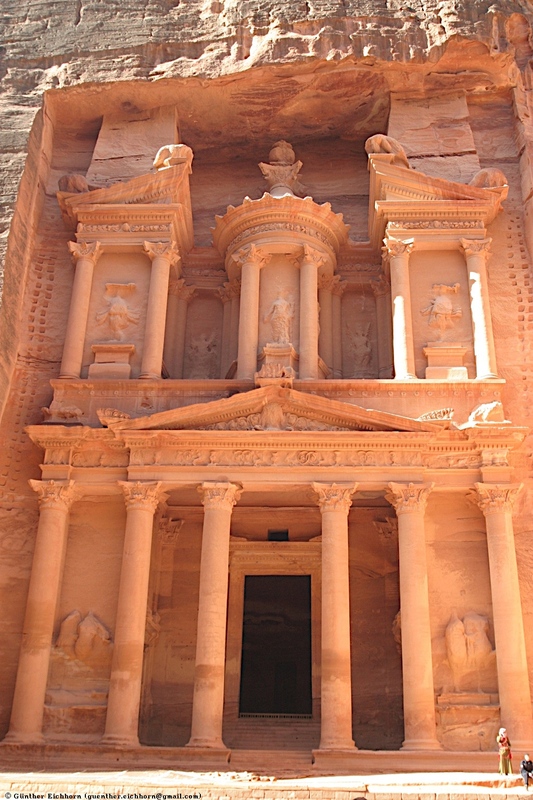 Then you get your first glimpse of the Al-Khazneh (the Treasury), one of the most magnificent buildings in Petra. 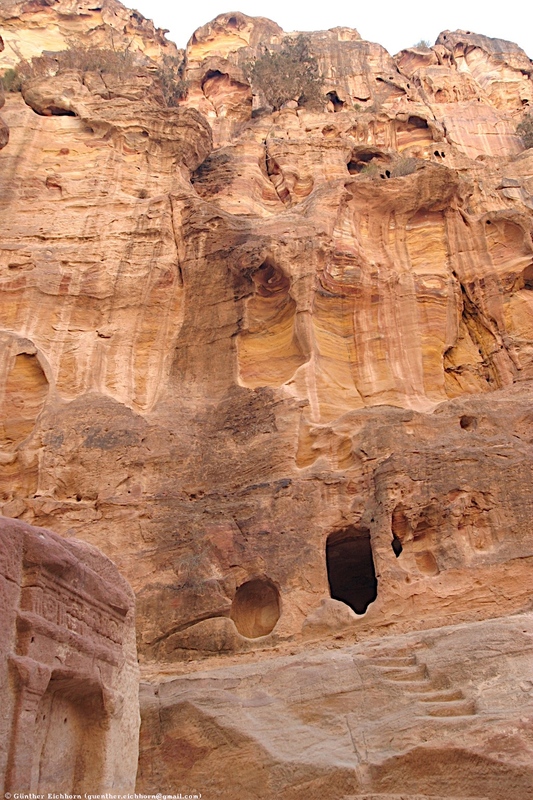 A temple carved out of orange-red sandstone, glowing in the sun. It is an awesome sight! 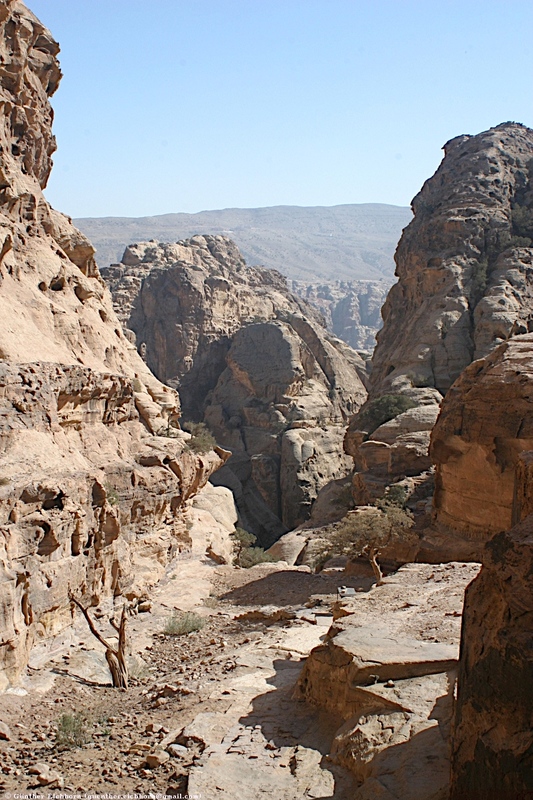 From Al-Khazneh you continue in a fairly narrow valley for a bit more, before the valley opens up. 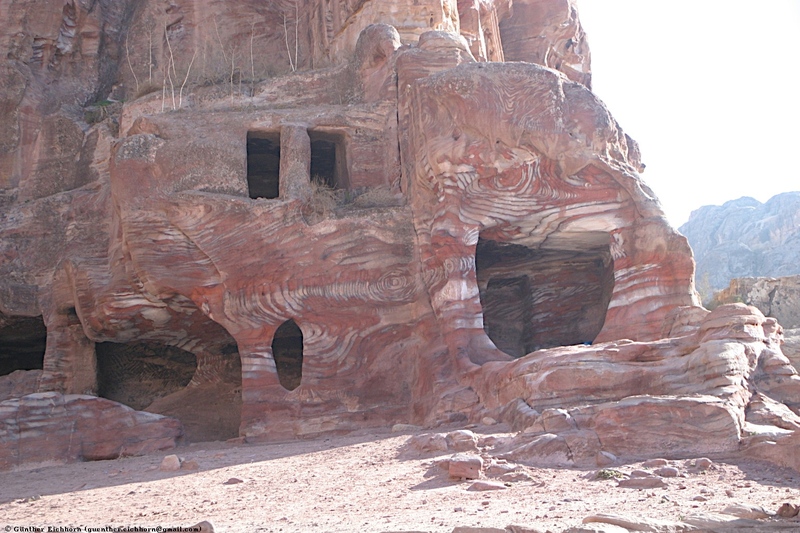 There are more buildings carved out of the rocks in that part of the valley. 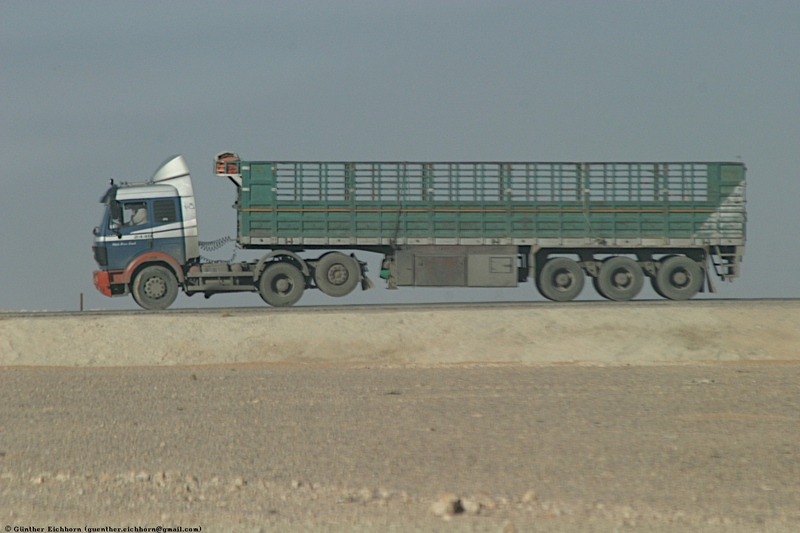 You can hire a camel or a donkey, or continue on foot. 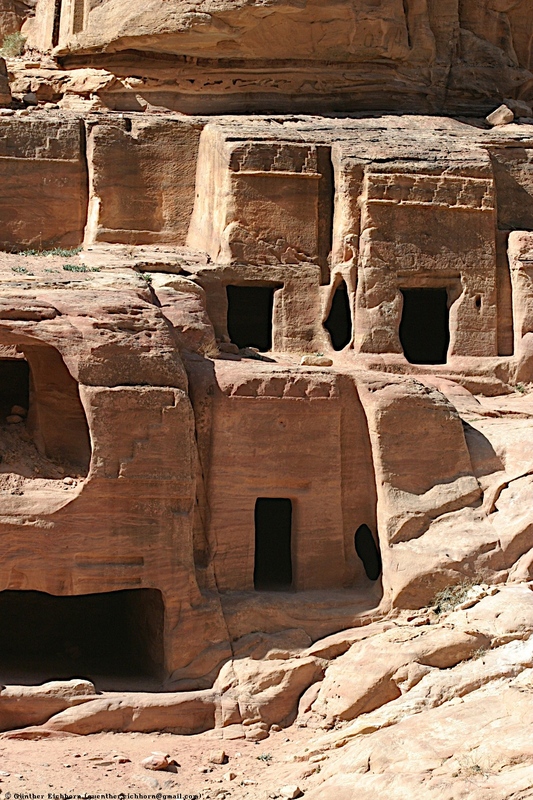 All the walls of the main valley are riddled with tombs carved out of the rock. The most impressive part is the east side of the valley. 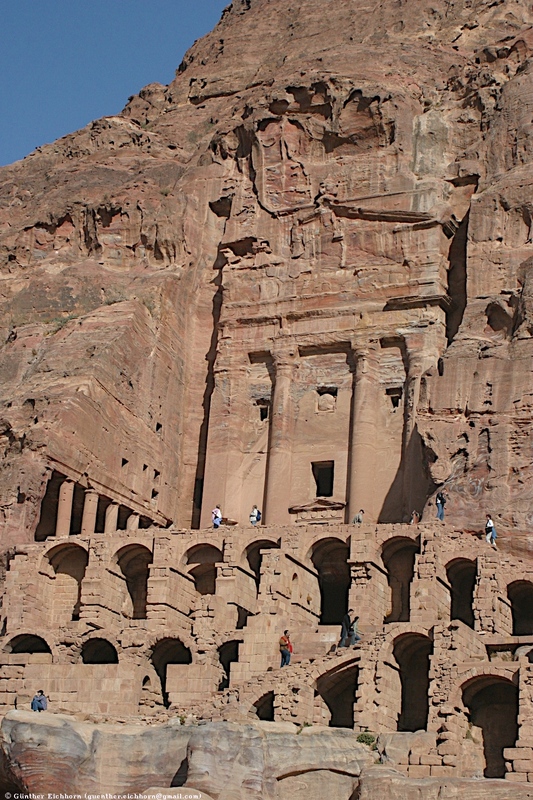 There is a facade, over 100 m (330 ft) wide, with one impressive tomb after another. 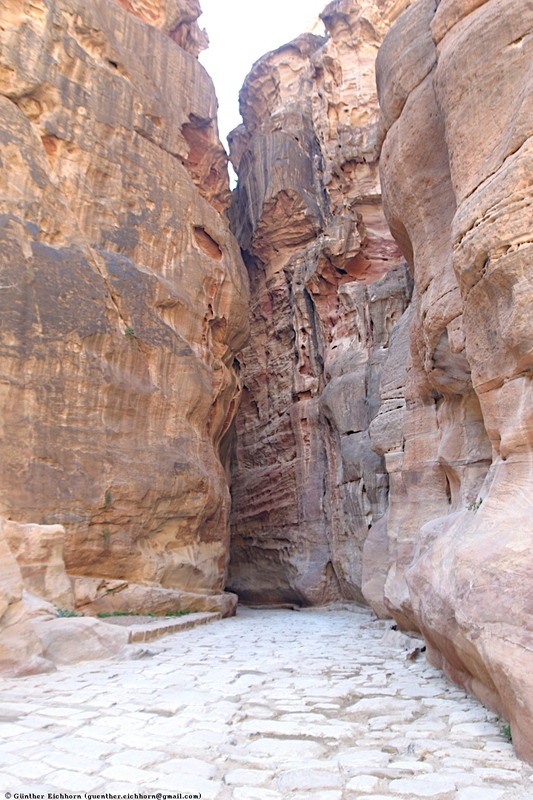 You continue into the valley to the Roman part of Petra. 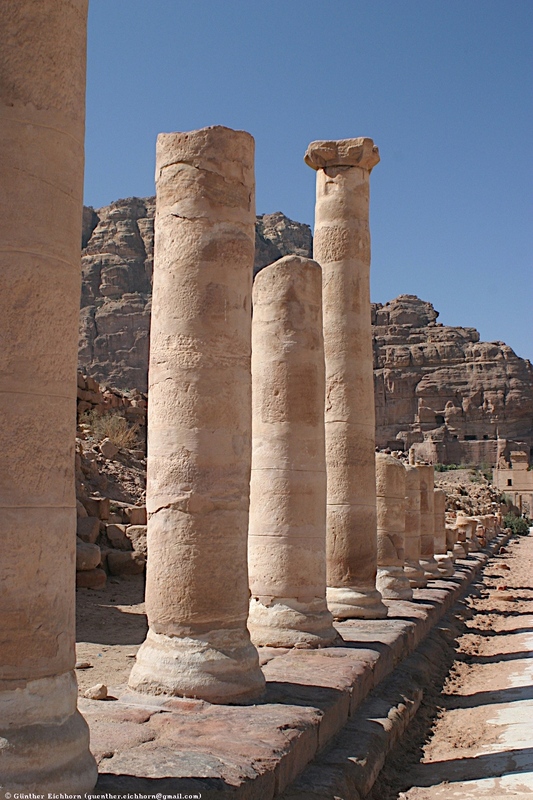 There are temples, baths, and a street lined with large columns. 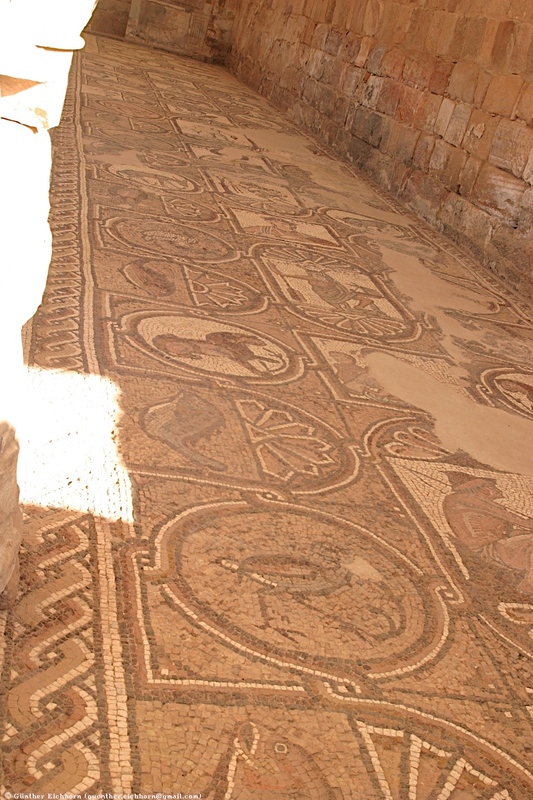 On the other side of the valley, opposite the Roman ruins are the ruins of the byzantine church with the floor mosaics. 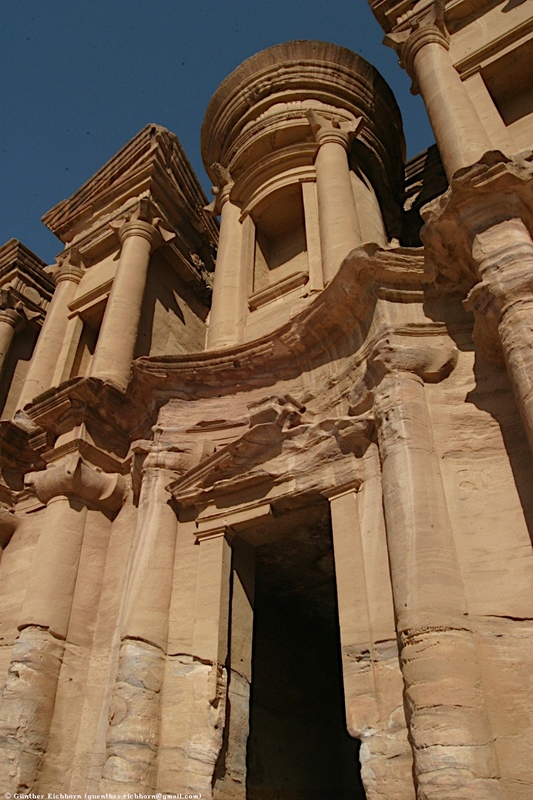 So far you have seen the main part of Petra. 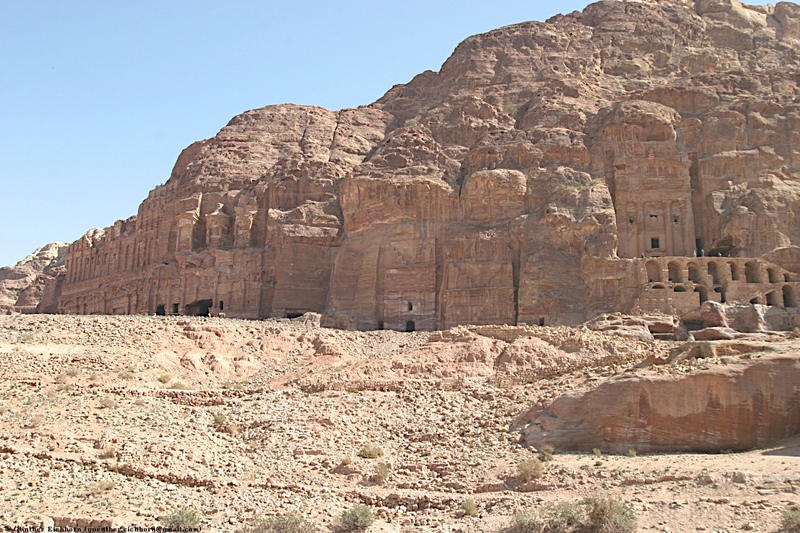 There is one more part that is worth seeing, the "Monastery". 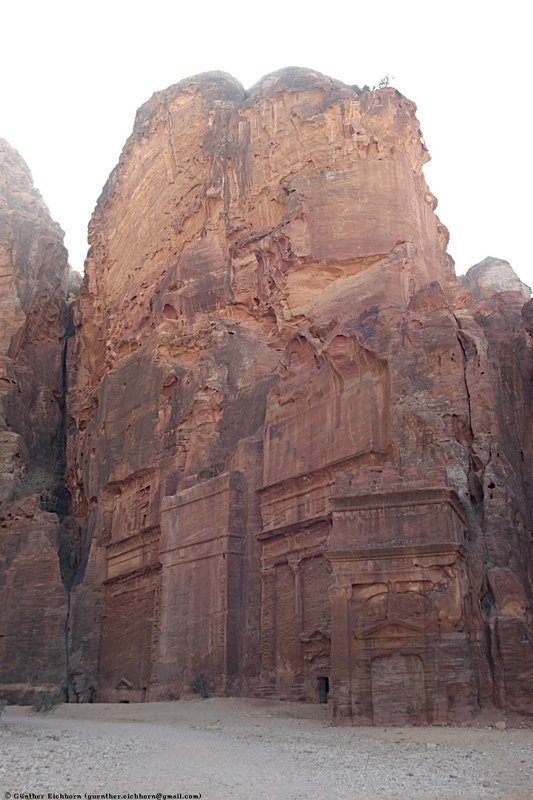 It is a spectacular temple, carved out of the rock, similar to Al-Khazneh. 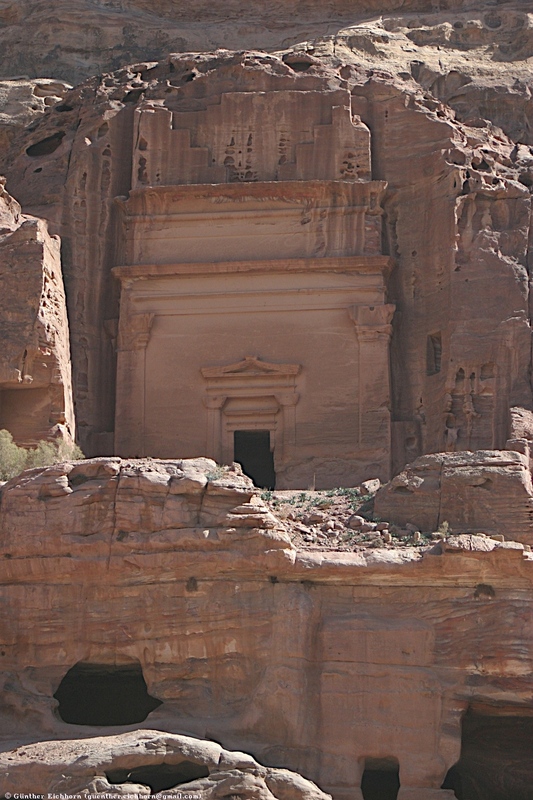 This one is high up on a mountain behind Petra. 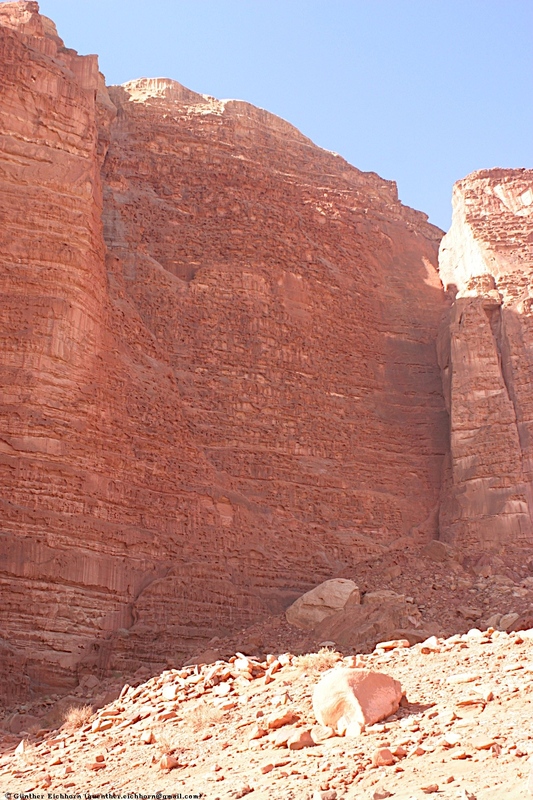 You reach it by climbing up some 1000 steps. You can either walk up, or hire a donkey. 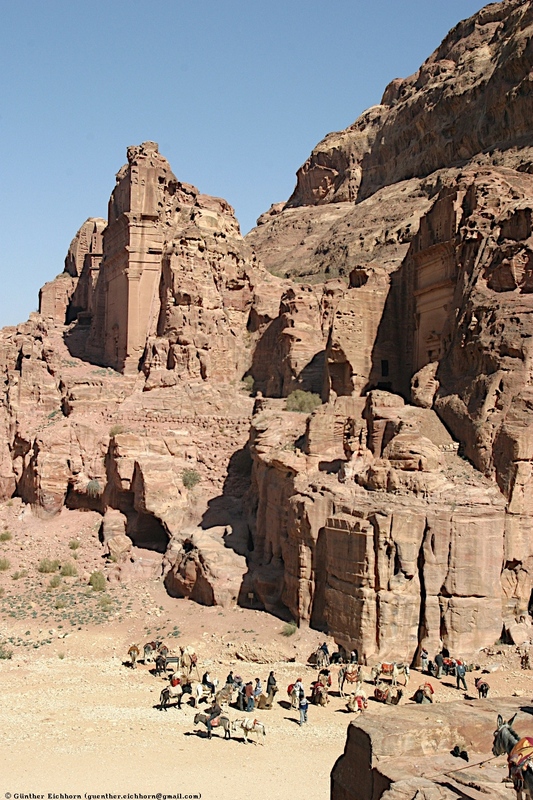 I decided on the latter, since walking up to the Monastery would take most of an hour. 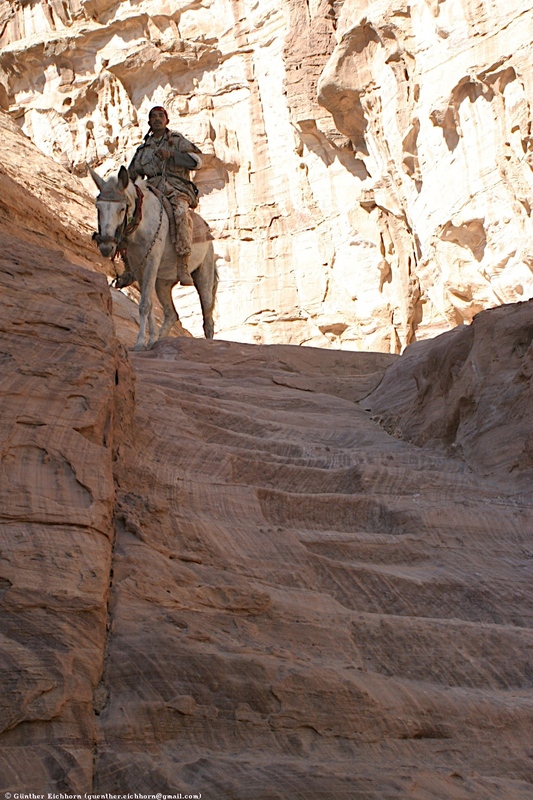 The donkeys climb the regular stairs. They are very sure-footed. The ride up the mountain was fine, but I wouldn't try to stay on one of them on the way down, the ride up was wild enough. 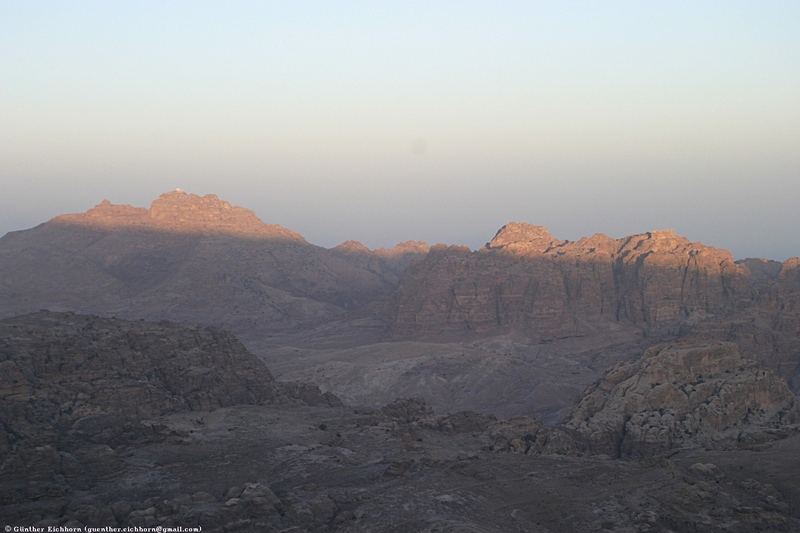 From the top of the mountain you have impressive views, both toward modern Petra and toward the mountain ranges on the other side. 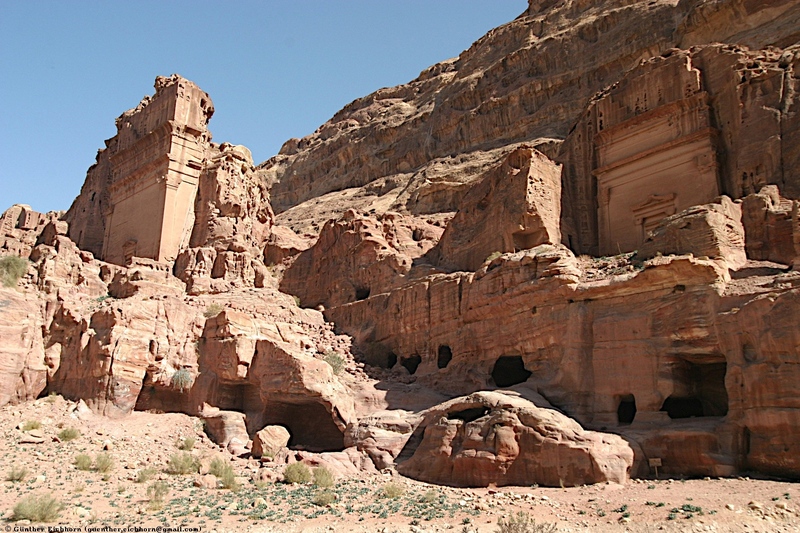 The Monastery is as spectacular as the Treasury, except for the colors. The walk back down the mountain takes about ½ hour. I had sore legs for the next couple of days from walking down 1000 stairs. 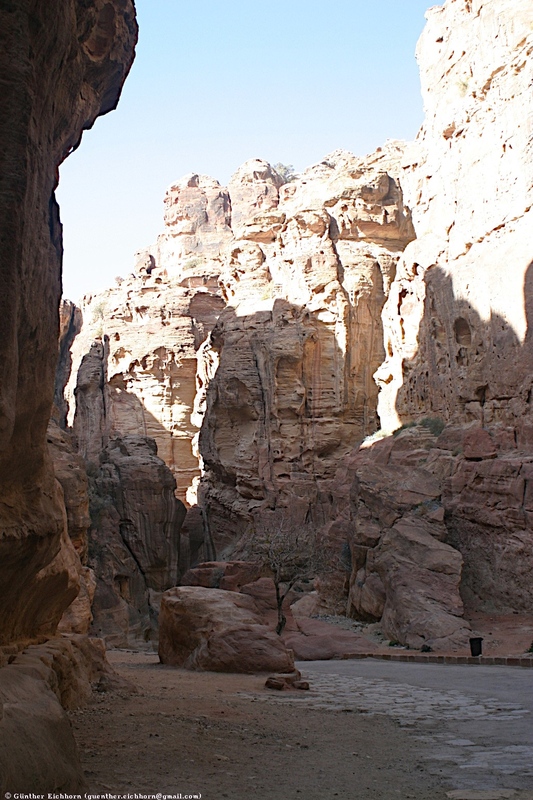 From there you walk back to As-Siq (or hire a camel or donkey), and then walk back through the gorge. 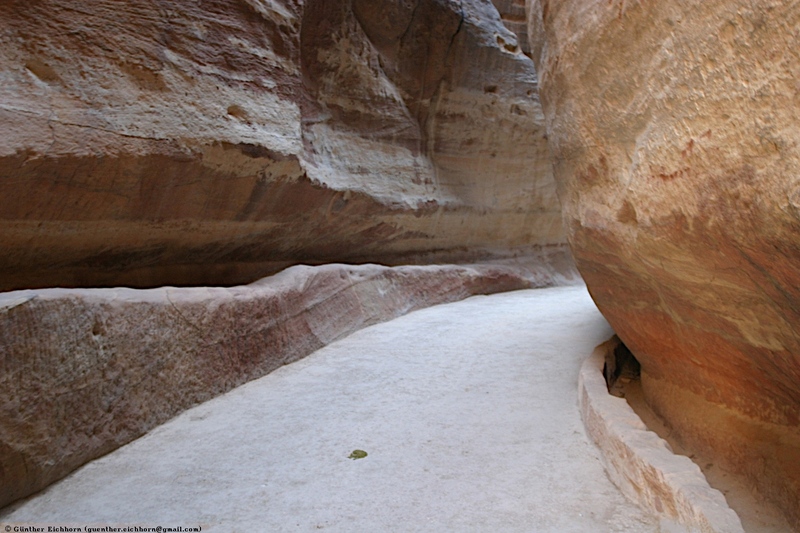 For the last part, the road from As-Siq to the visitor center you can take a ride on horseback. That was a welcome relief after walking around Petra for about 7 hours. 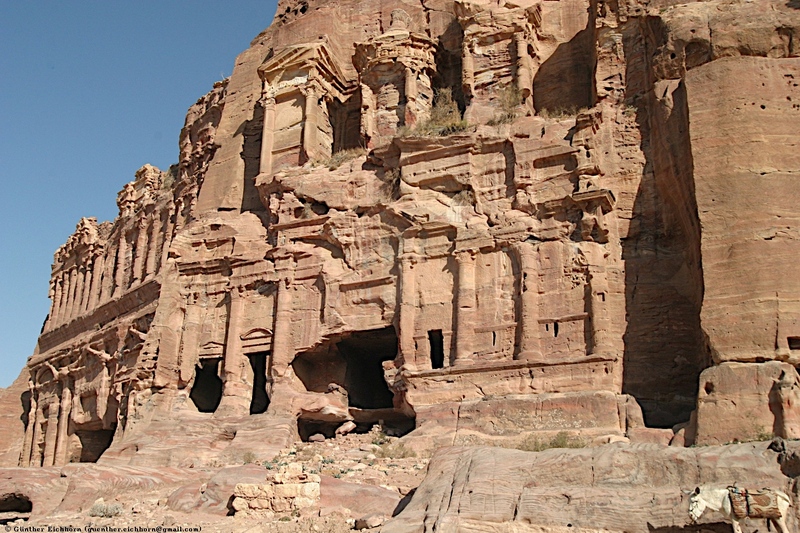 Petra is a spectacular site. 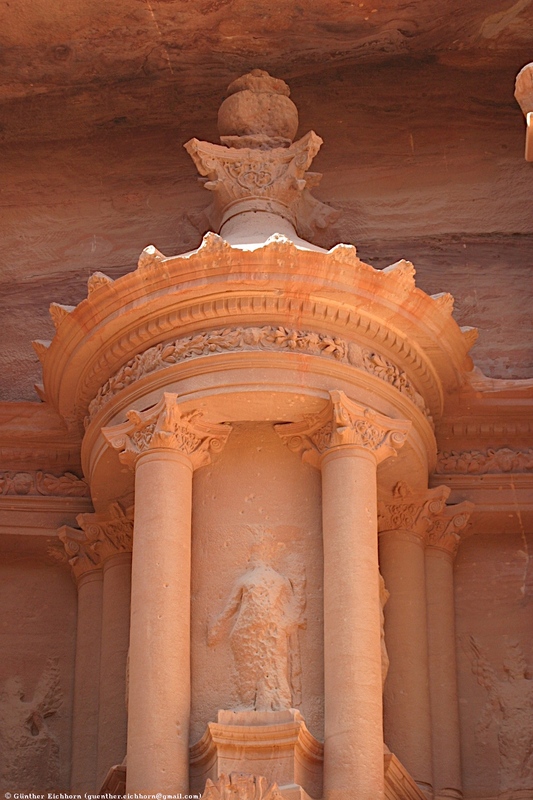 Petra is a UNESCO World Heritage Site. If you ever visit Jordan, Petra has to be the most important part of your visit. 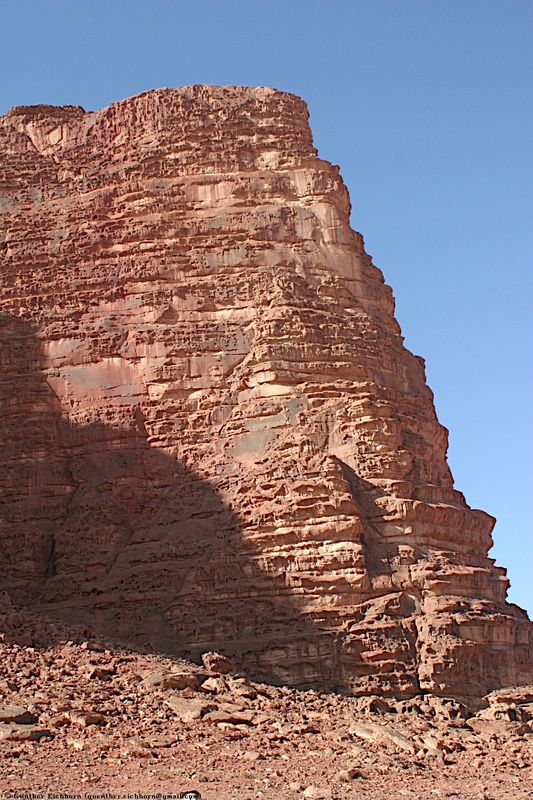 The next morning we drove further south to Wadi Ram. 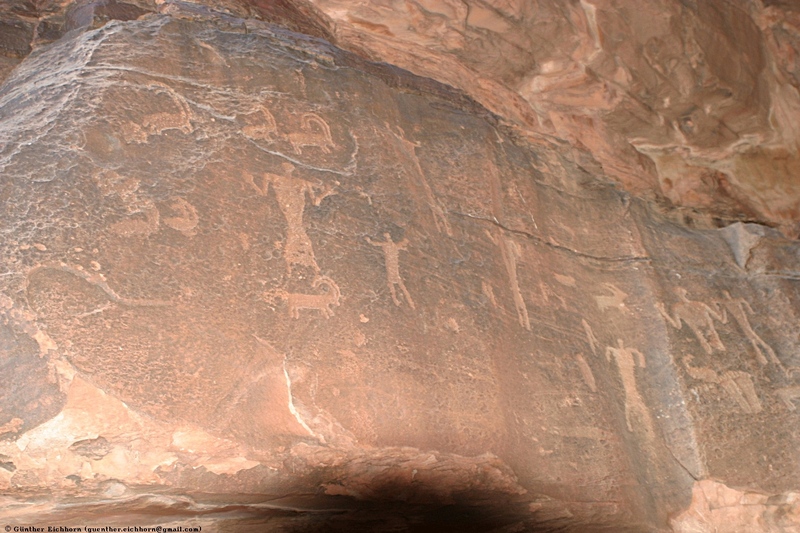 Wadi Rum Protected Area is a UNESCO World Heritage Site. 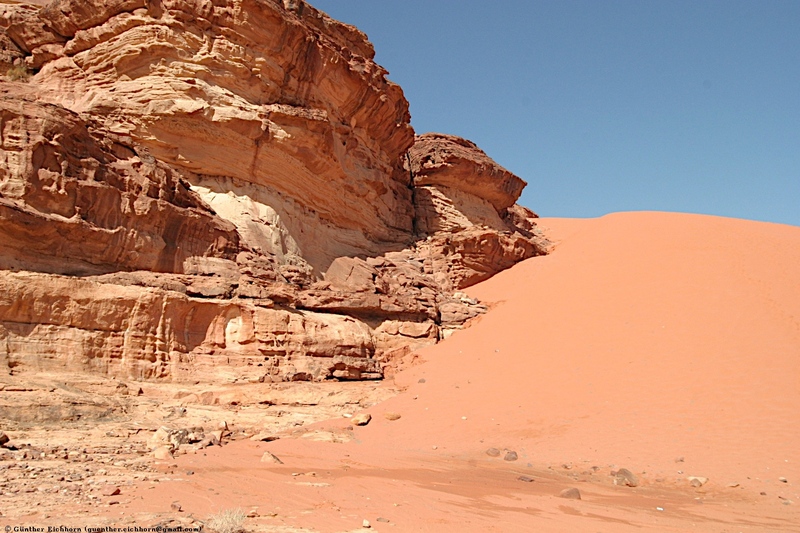 Wadi Ram is a very scenic desert area with spectacular desert vistas. 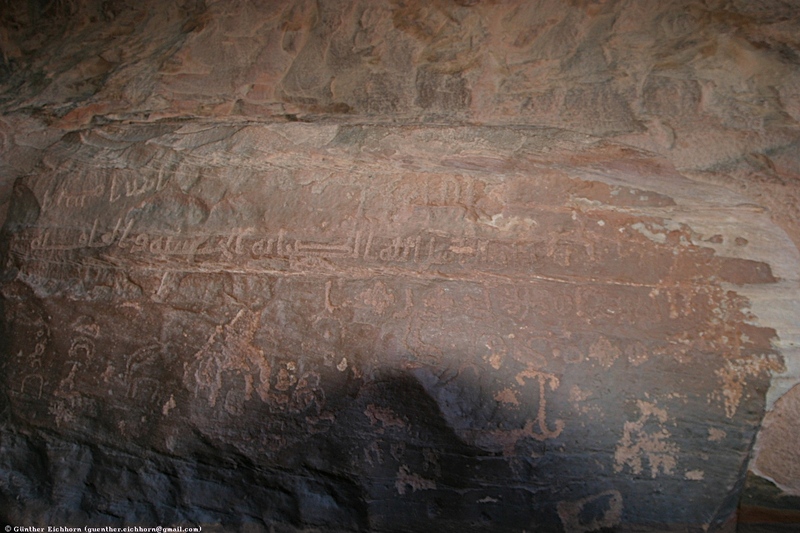 In one small gorge in Wadi Ram are stone carvings of different figures and ancient Arabic script. 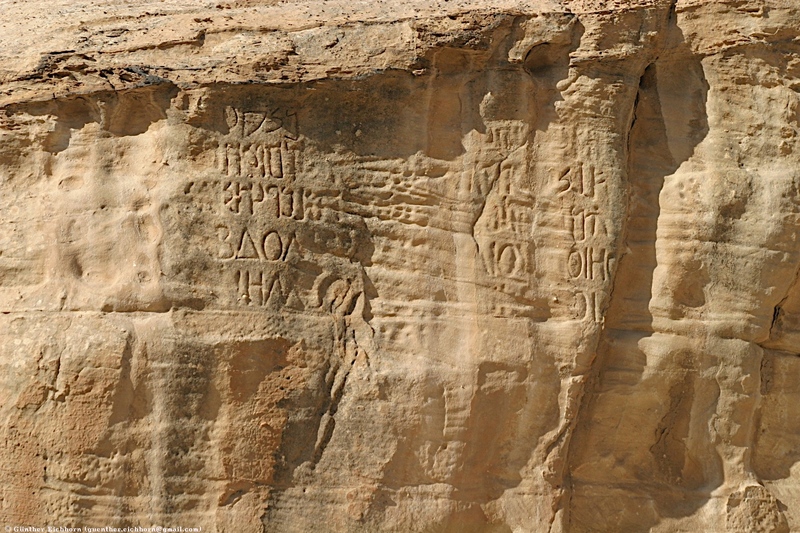 These come from Nabataean times. 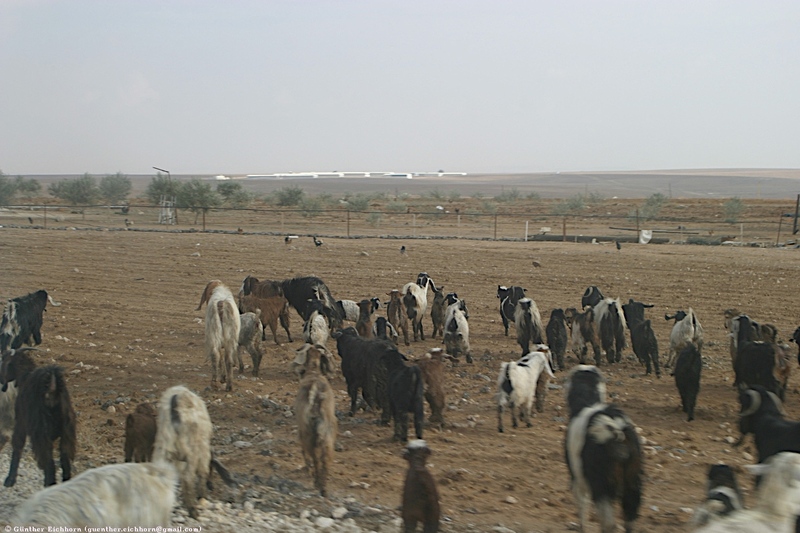 There live about 5000 Bedouins in this area. The major tribe there are the Huweitat. 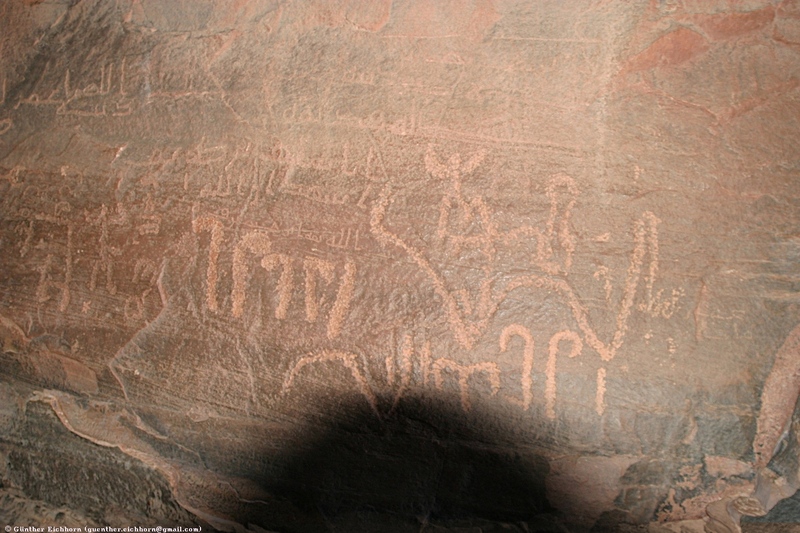 They claim to be descendants of the Prophet Mohamed. 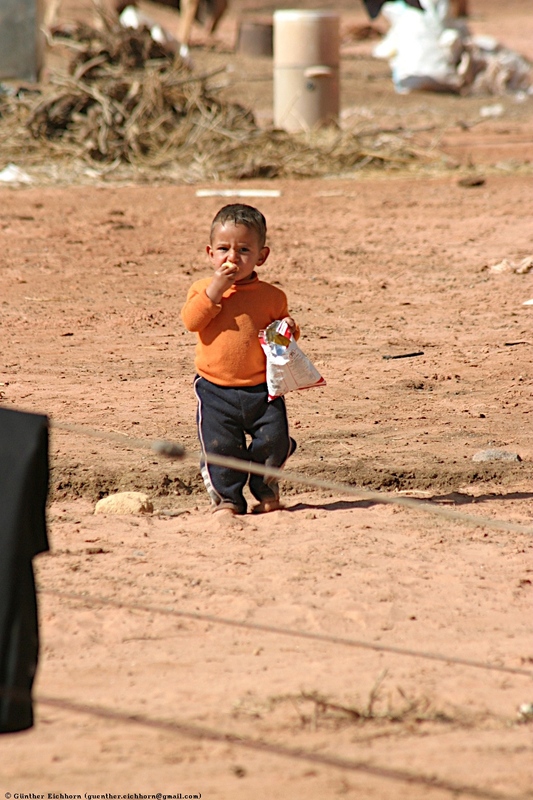 We visited a camp of these Bedouins. 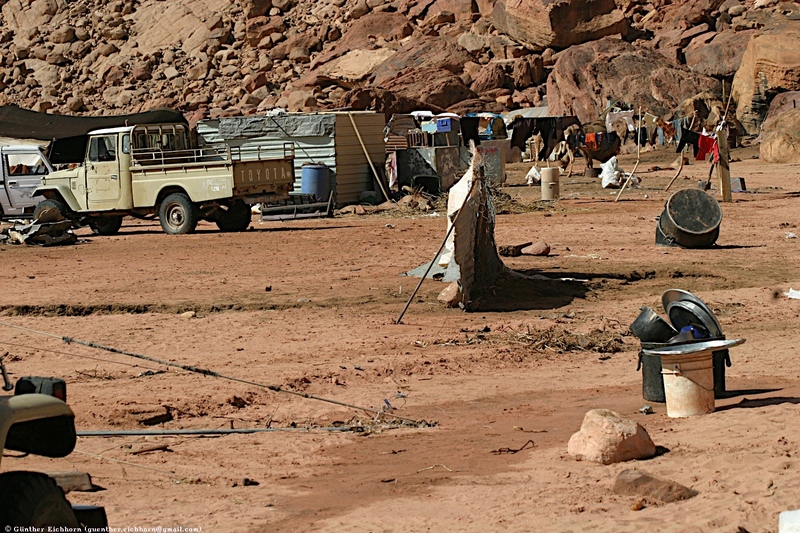 They have replaced the camels and donkeys with 4-wheel-drive vehicles and hang on cell phones just like everybody else in Jordan, but I think they are still quite a bit poorer than the average Jordanian. 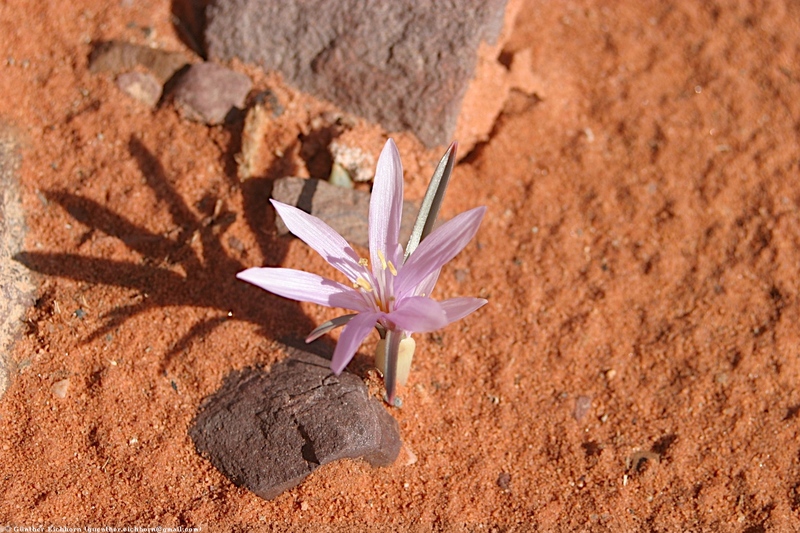 There is life in the desert, but you don't see much of it. 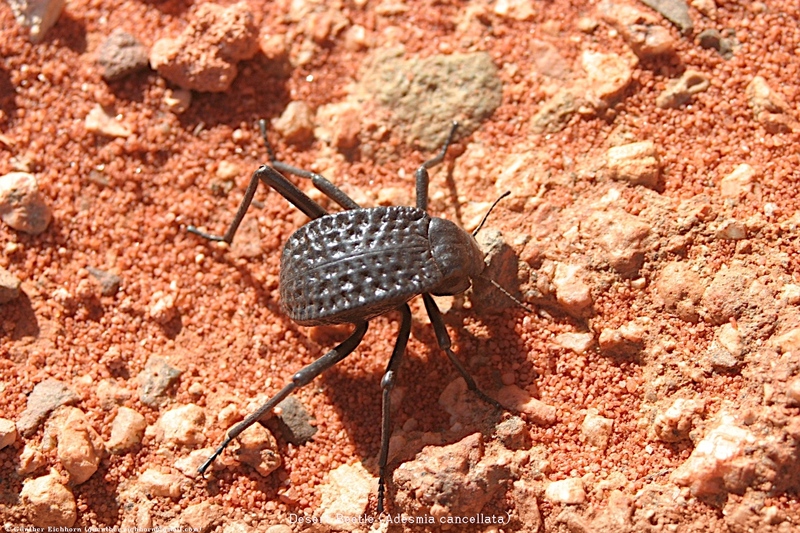 I saw some desert plants, and a desert beetle in Wadi Ram. 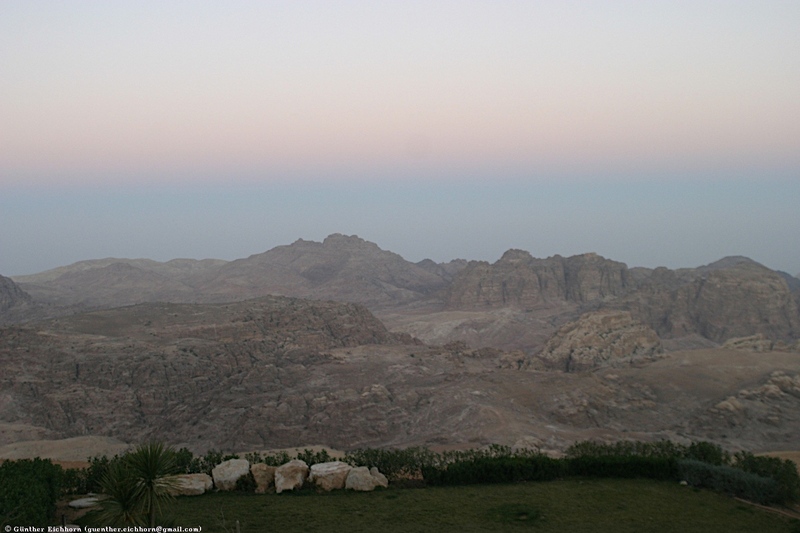 From Wadi Ram we drove back to Amman for our flight to Egypt for the second part of my tour. 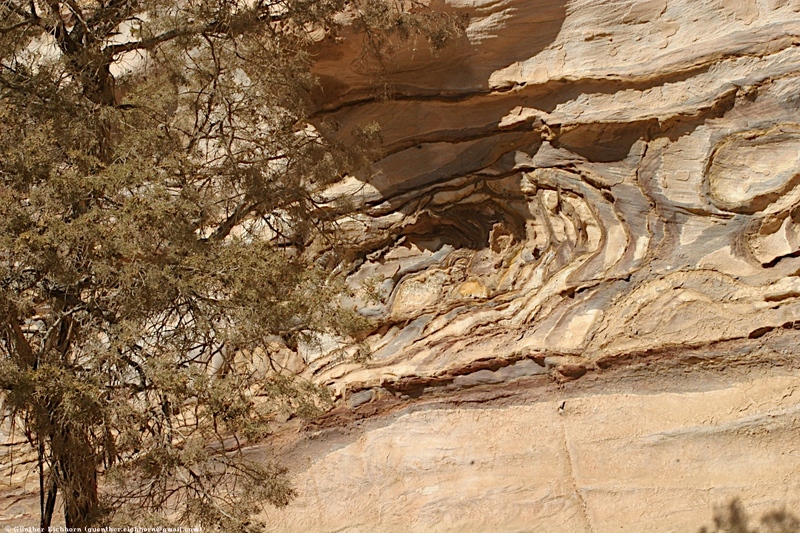 The tour in Jordan was very well organized. 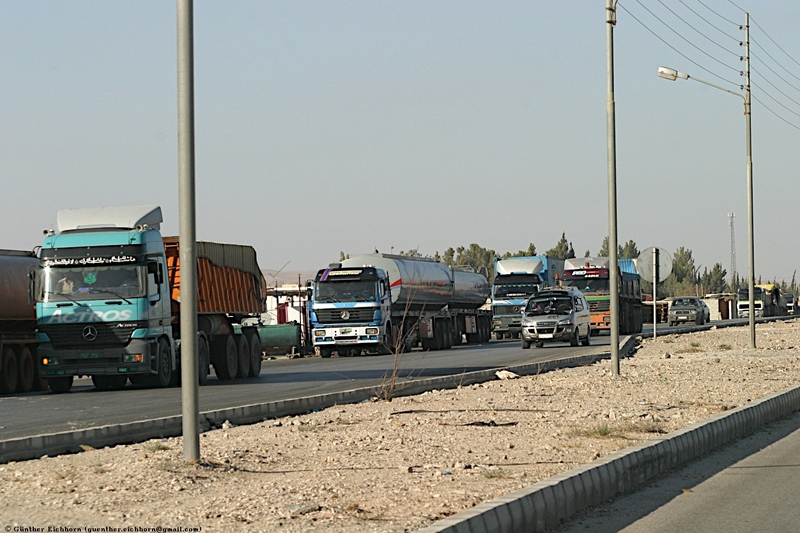 The only problem I had was that my pickup from the airport, two days later than the others, was a bit disorganized. OAT was not very helpful during this problematic time of my trip. OAT did not help me with rearranging my flight after my first flight was canceled, or with arranging for a hotel in New York after my second flight was delayed and I ended up missing the flight from New York to Cairo. But eventually everything worked out OK. Everything else during the trip worked out fine. 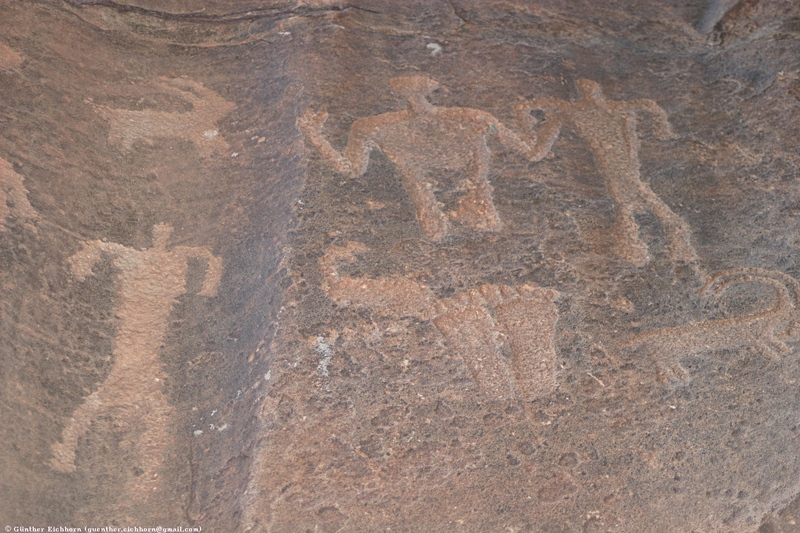 The travelers with OAT are a bit older than they were for instance with Explore, but not as old as with Eldertreks. Like with Eldertreks, none of the travelers went out for a beer in the evening, everybody was in bed by 21:00. 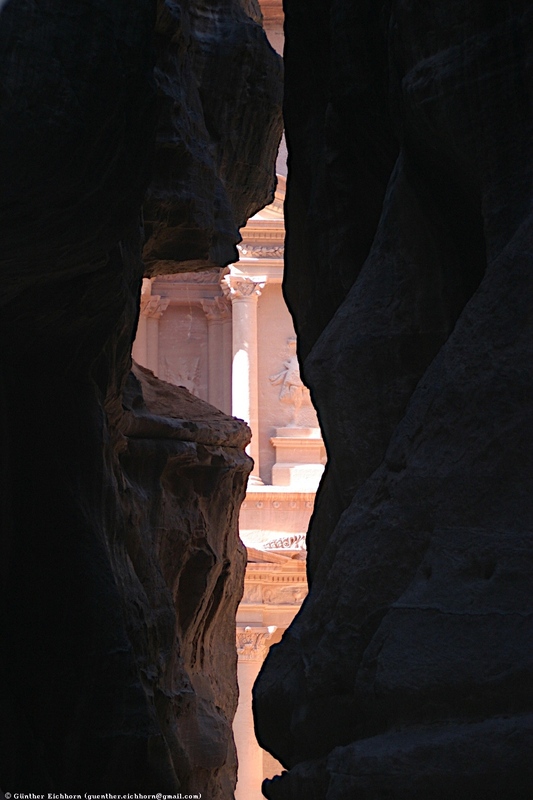 Because of my travel snafu I didn't see enough of Jordan, but what I did see was spectacular. It is certainly worth a trip.